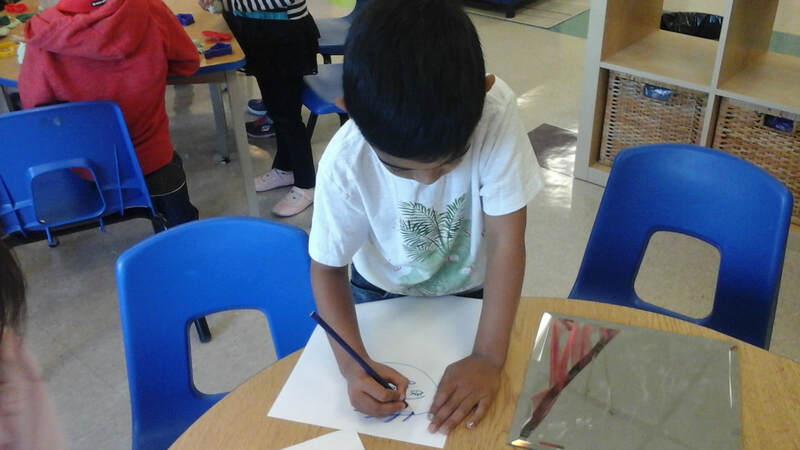 We would like to welcome all our new families to Kindergarten B and welcome back our families returning from last year. 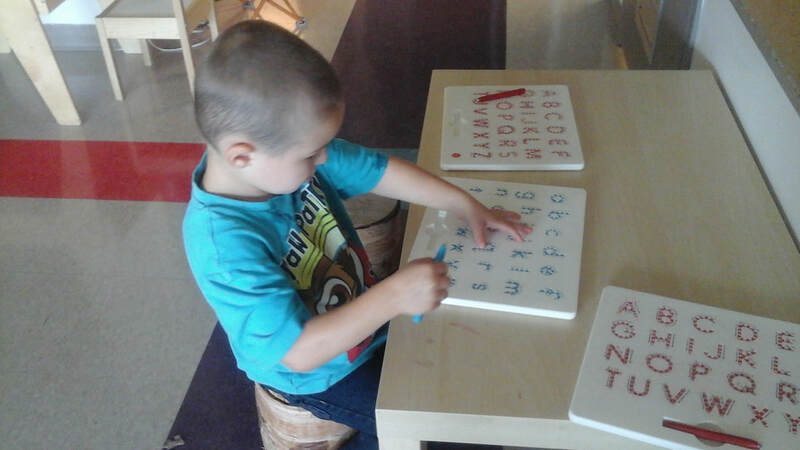 We had a busy first two months in KGB!! 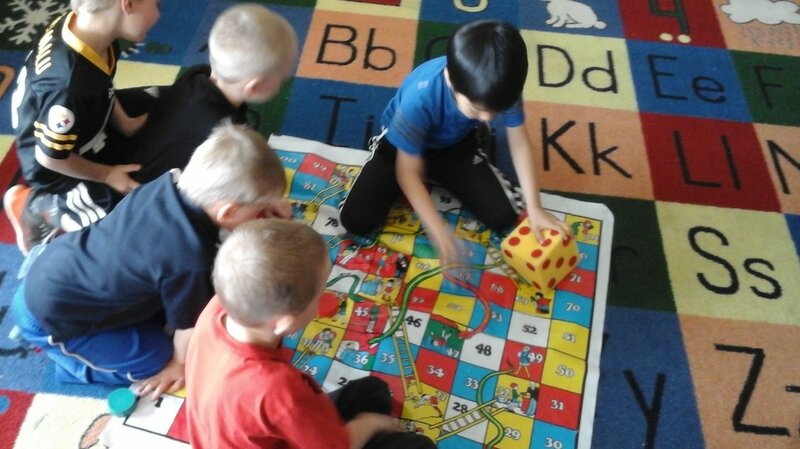 The children have been learning the class rules and routines in our classroom. 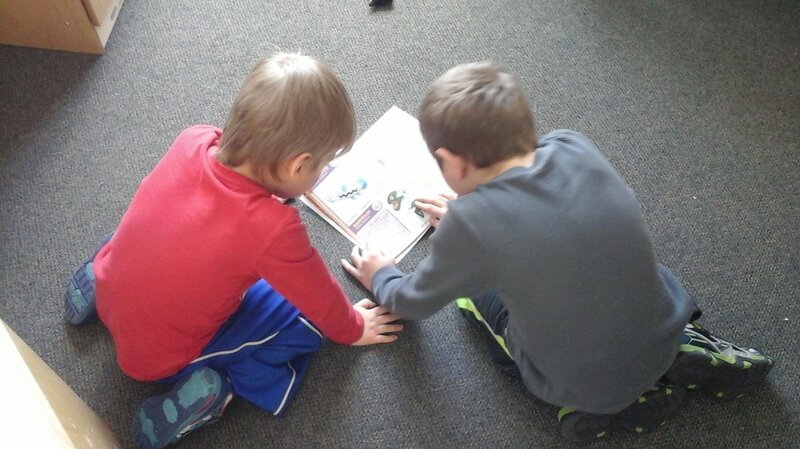 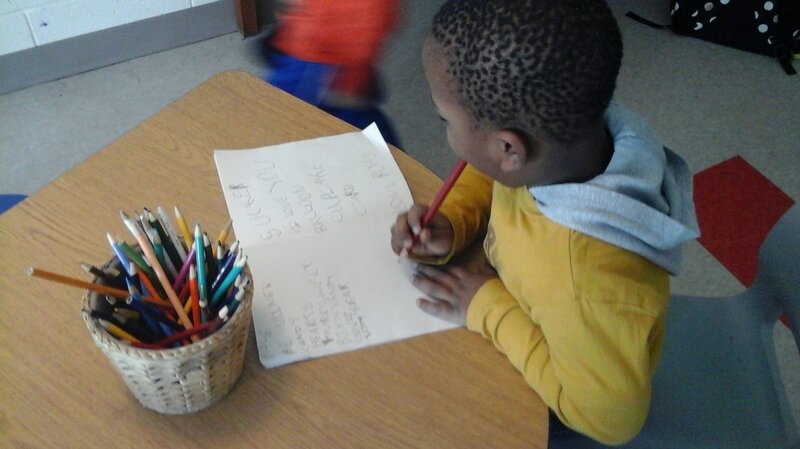 They have also been sharing things about themselves to their new classmates during large group community time. 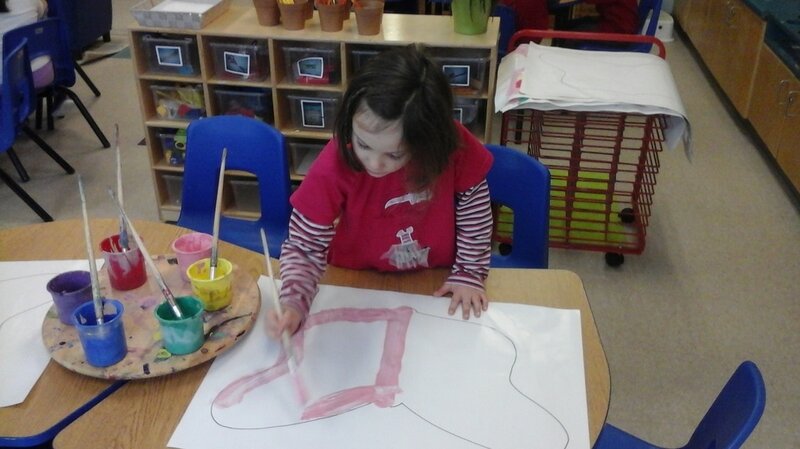 The children have enjoyed sharing family pictures to their peers. 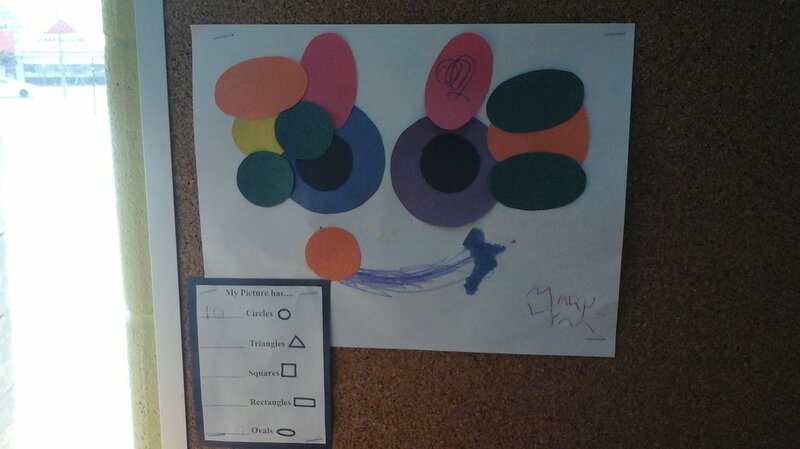 Thank you for sending in beautiful family photos. 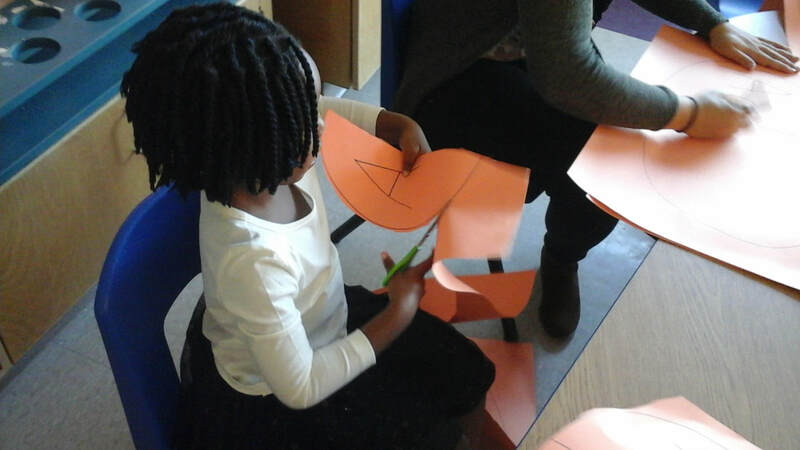 We are re-introducing letters and letter sounds through songs. 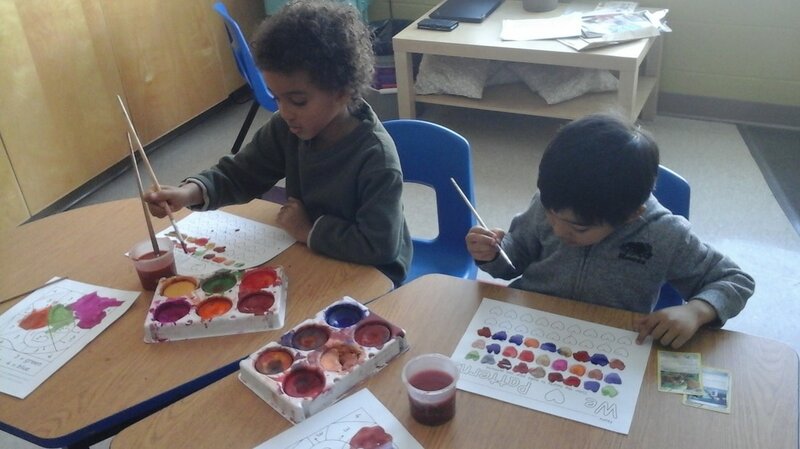 The season of FALL is a season of COLOURS. 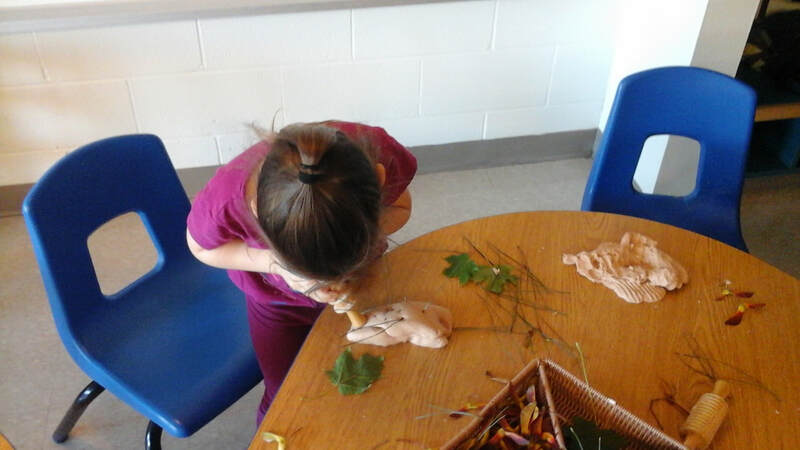 The children have discovered the changes that happen in the FALL. 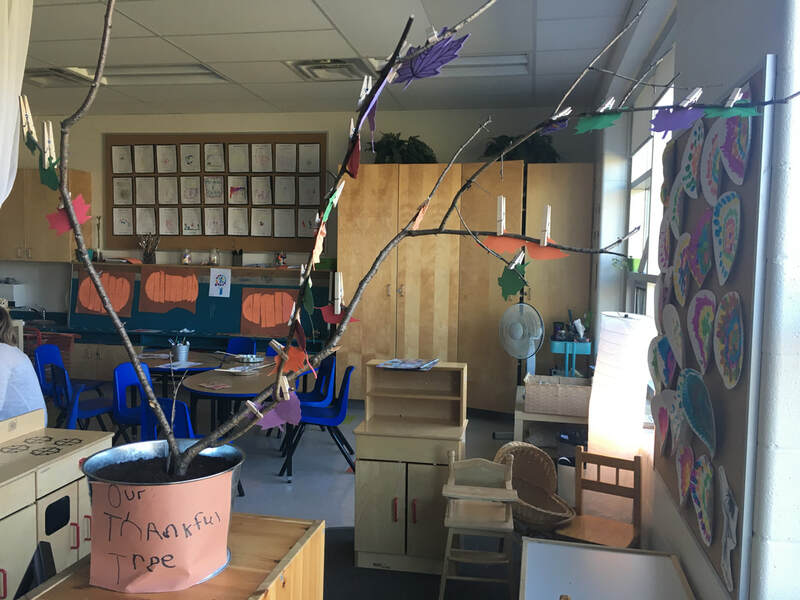 We have been experimenting with leaves using a variety of inquiry questions, i.e., What do you think happens to the leaves during FALL? 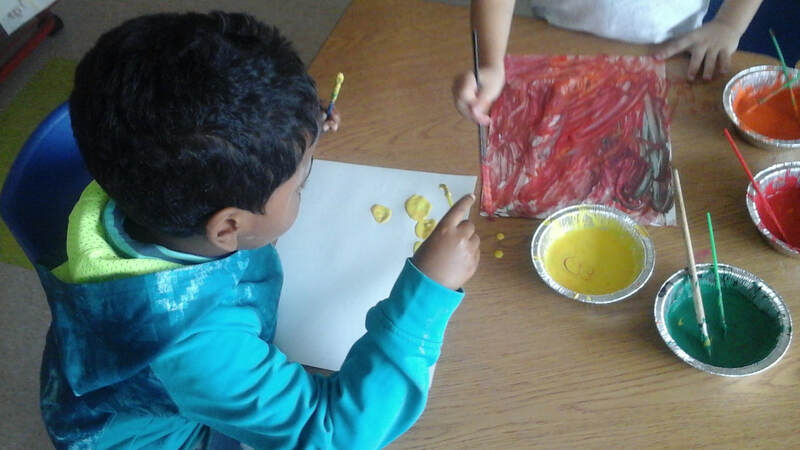 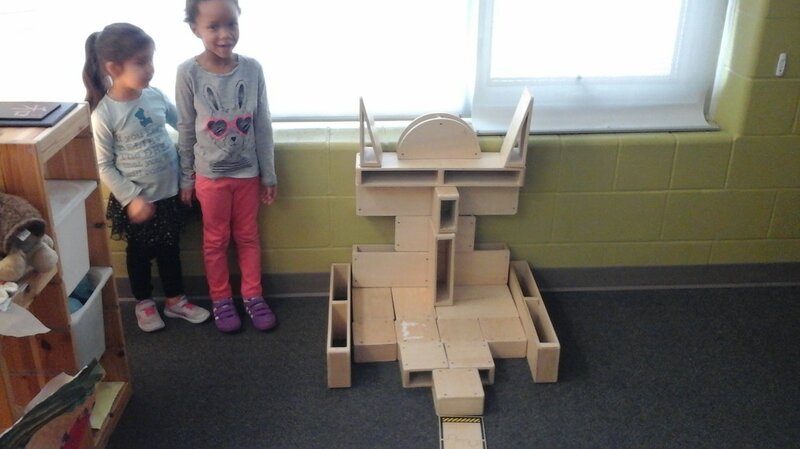 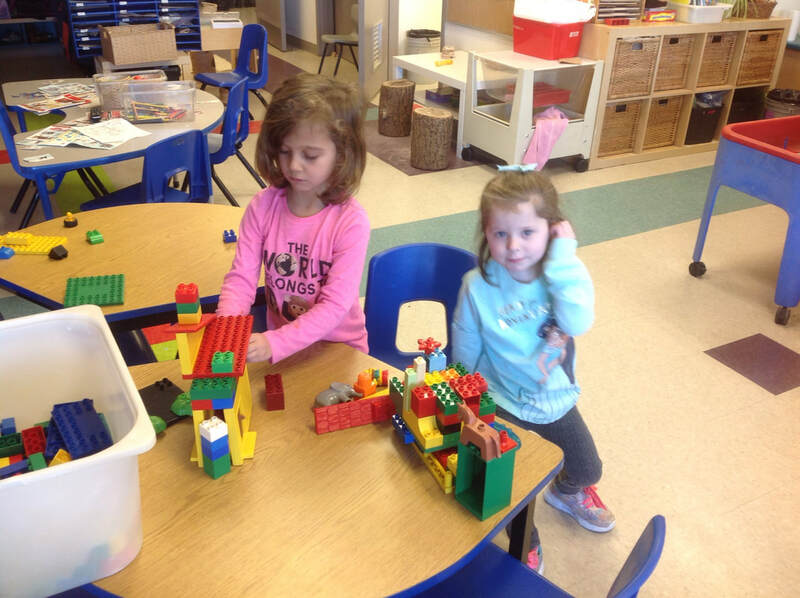 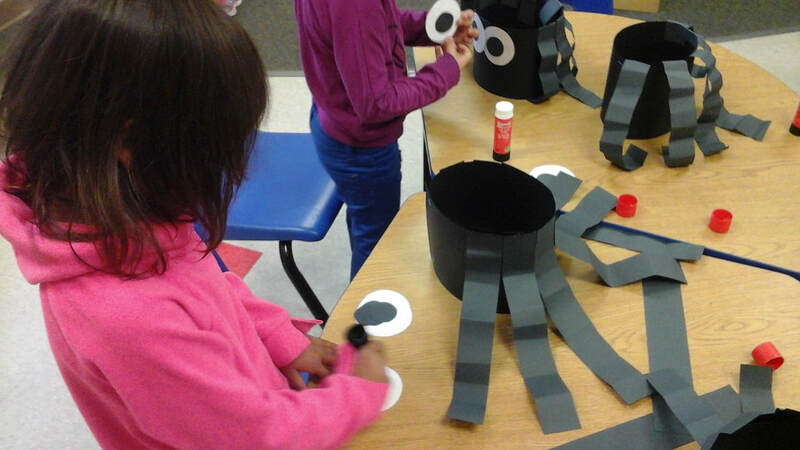 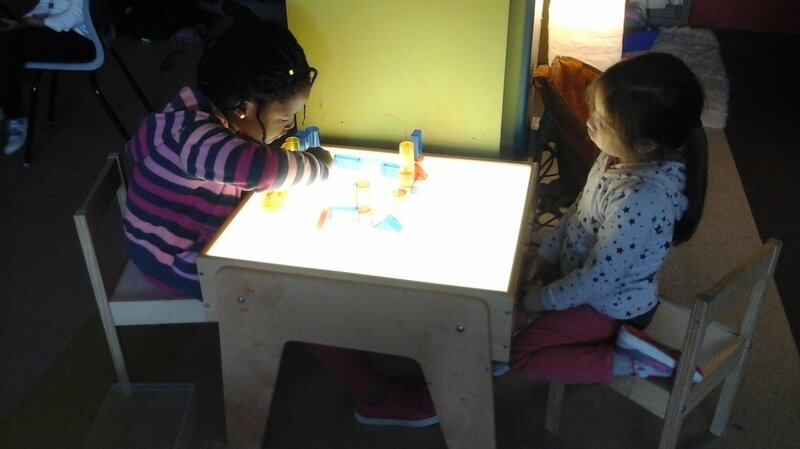 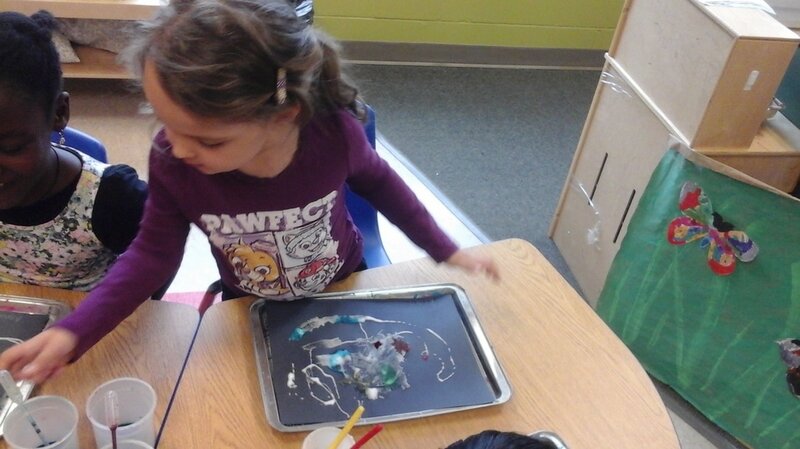 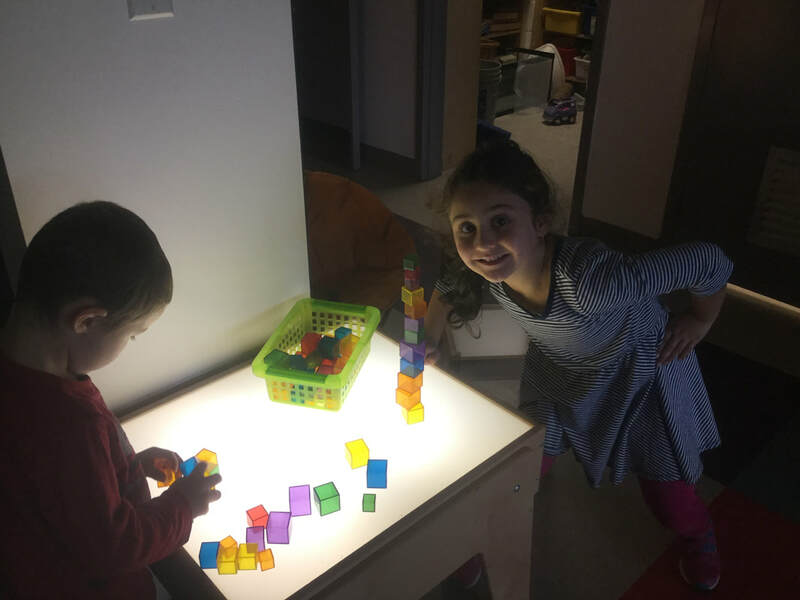 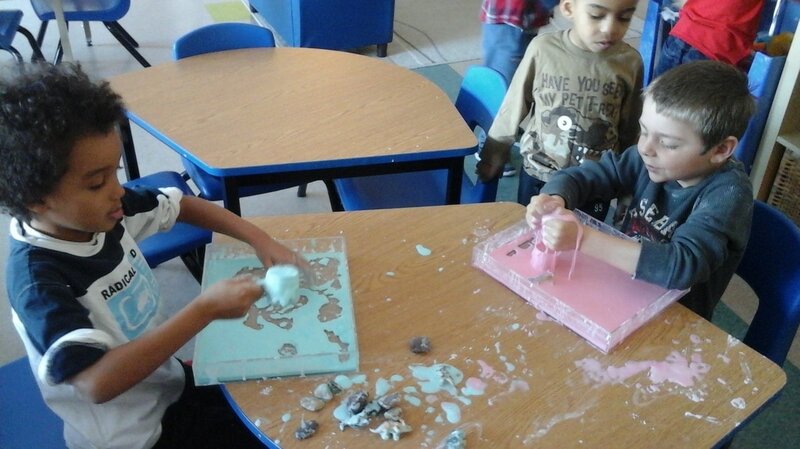 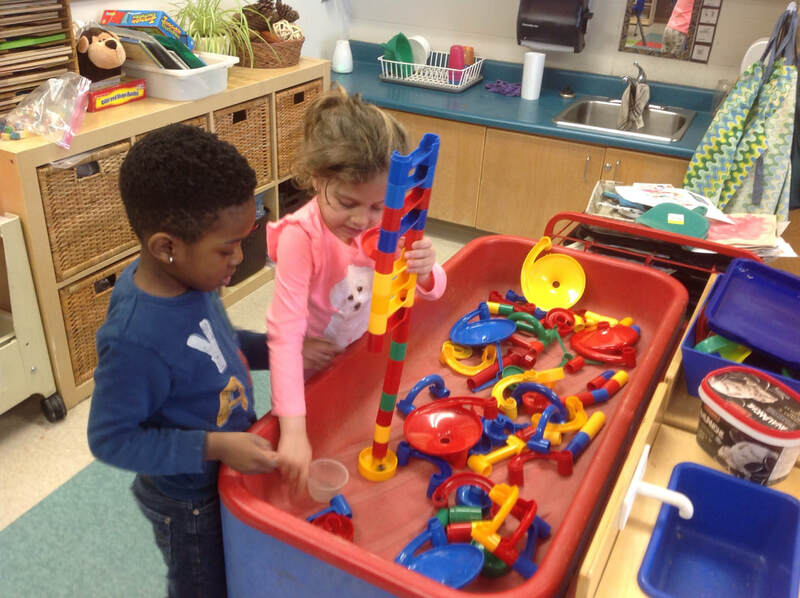 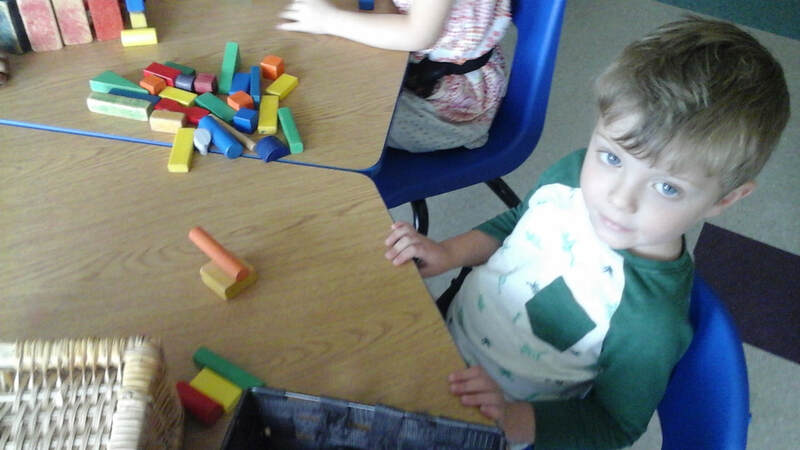 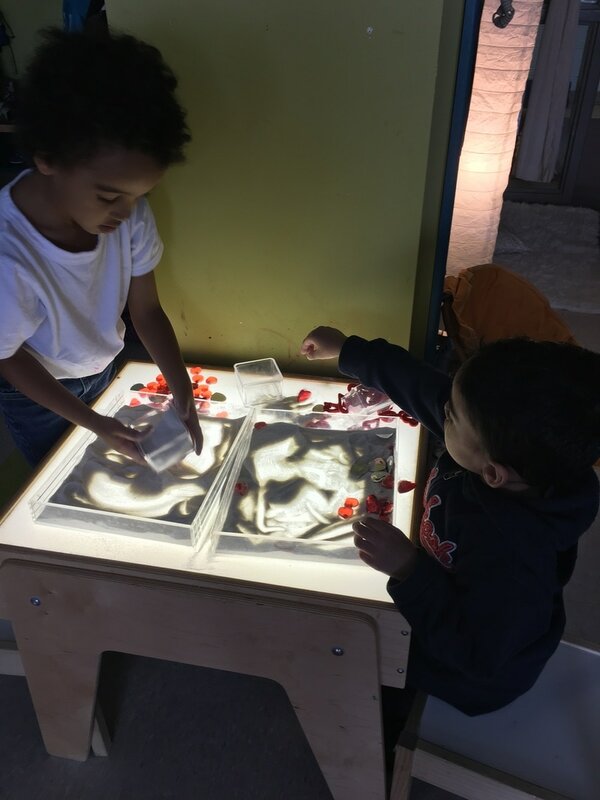 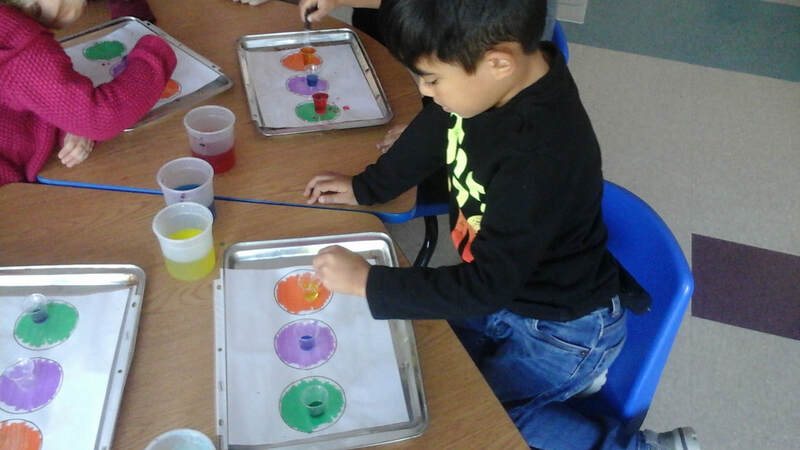 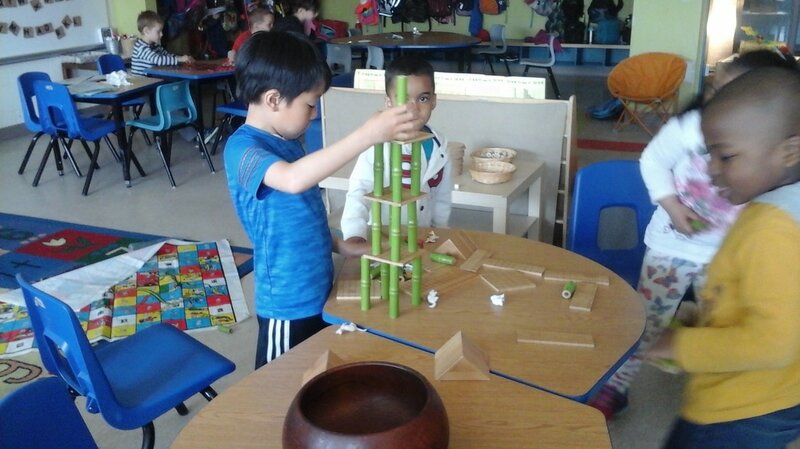 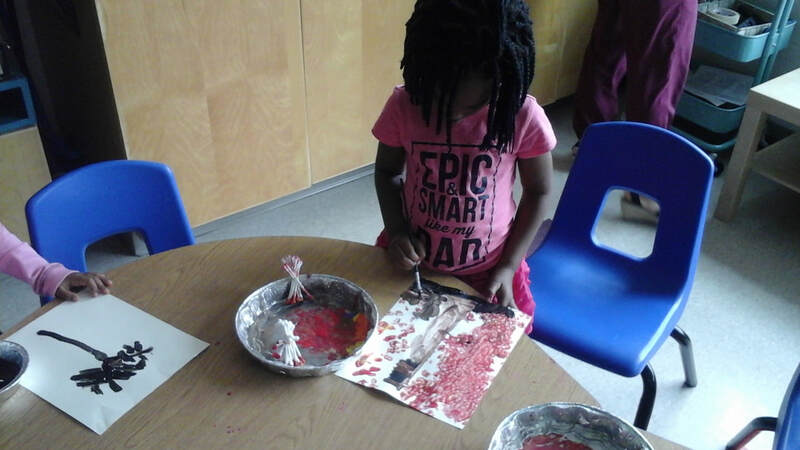 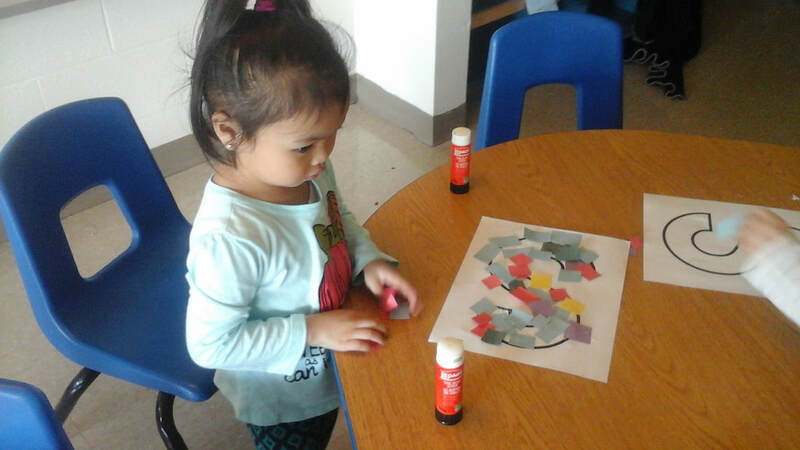 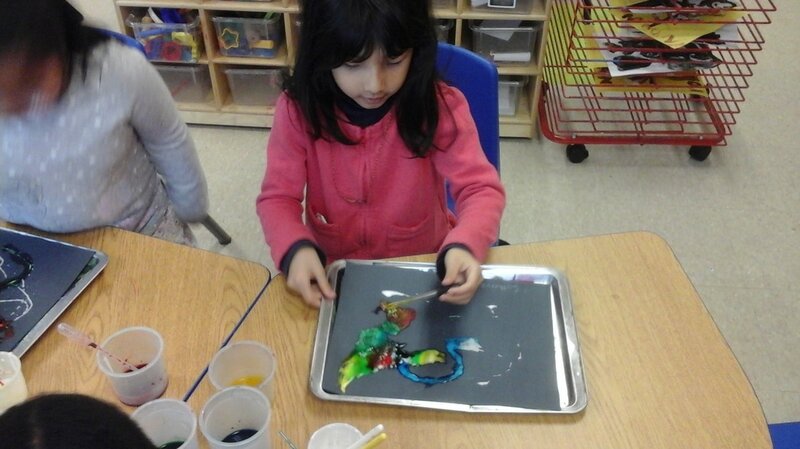 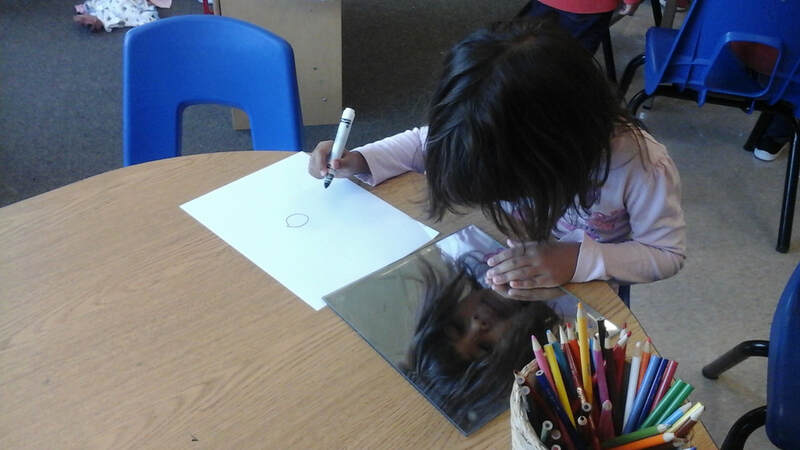 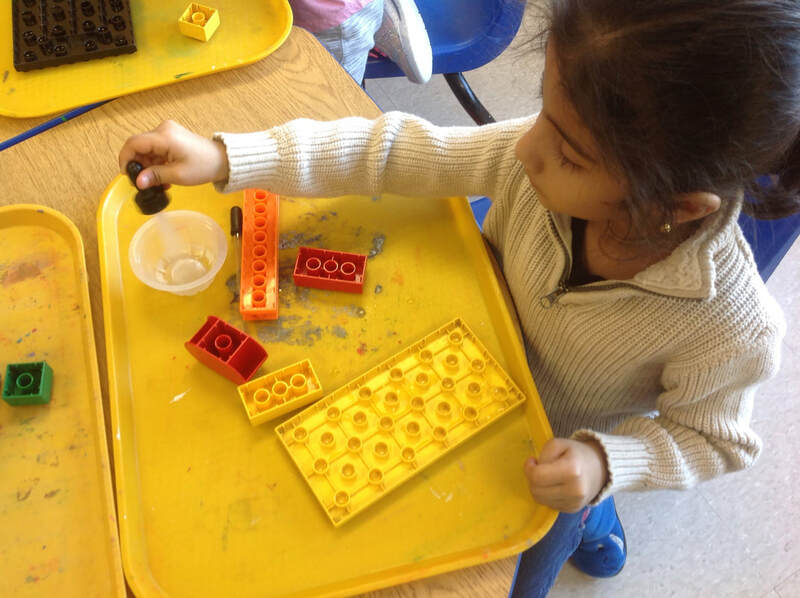 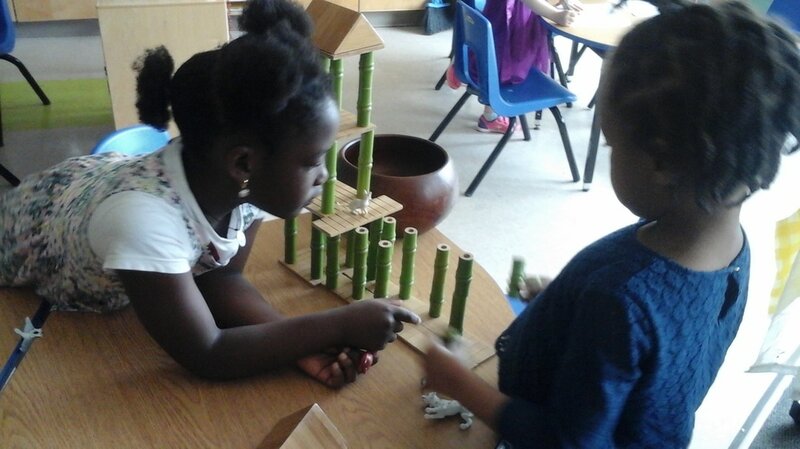 The children have been engaged in many activities throughout our learning centers which involved changes in FALL. 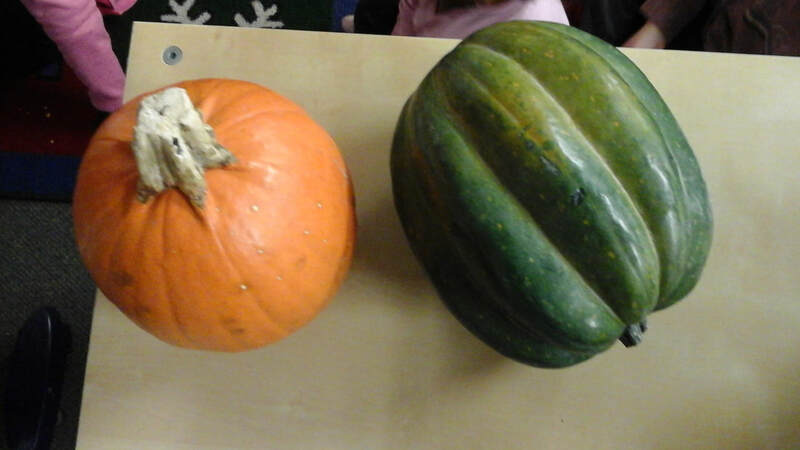 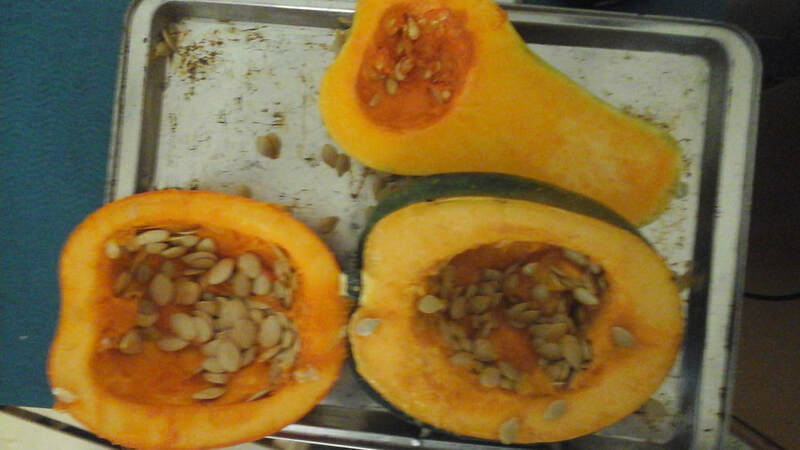 The children planted pumpkin seeds and have been exploring the changes that occur as the seed grows. 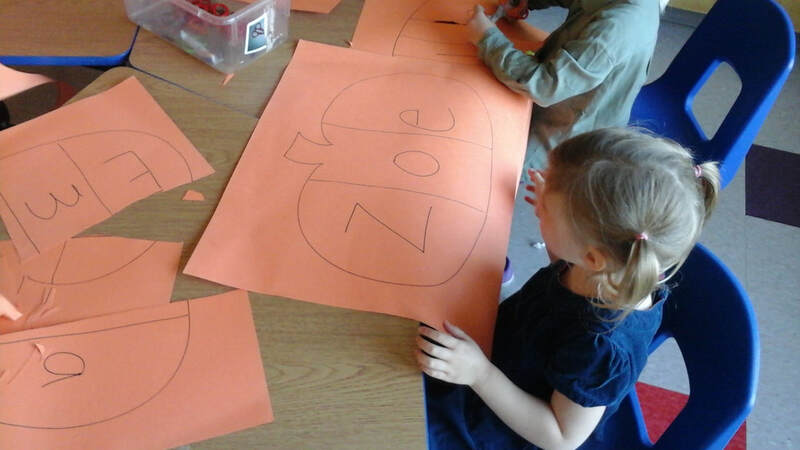 What are the stages in the Life Cycle of a Pumpkin? 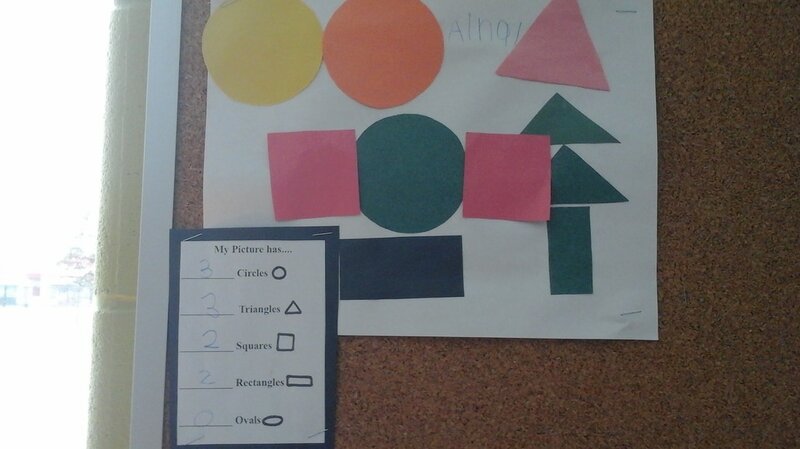 The children have been learning the stages in October. 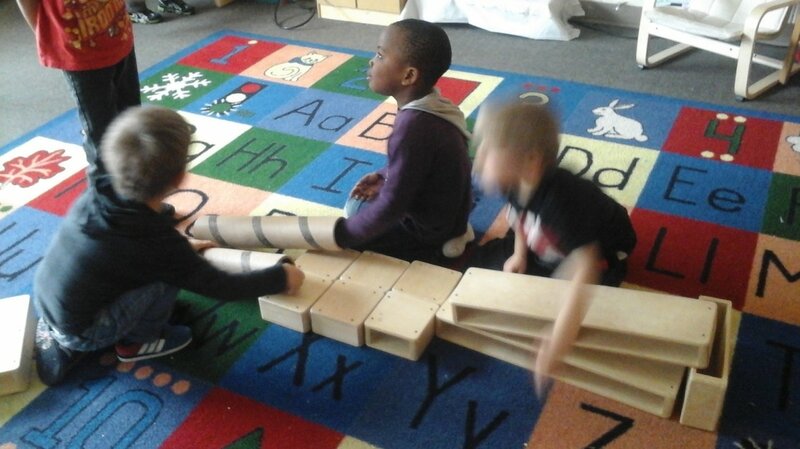 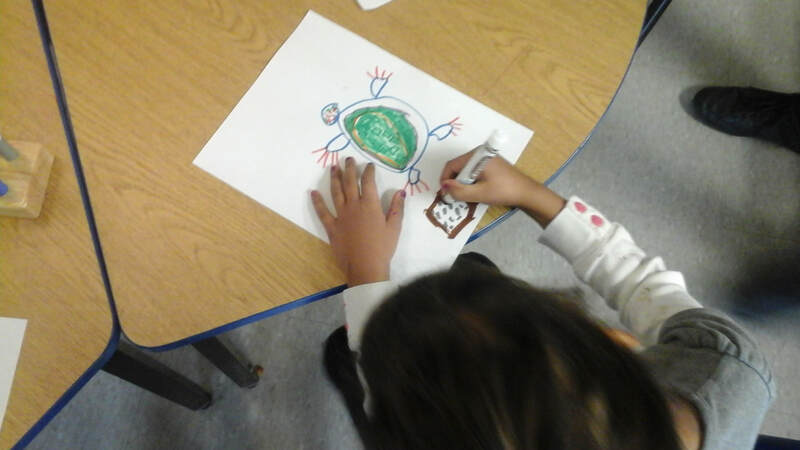 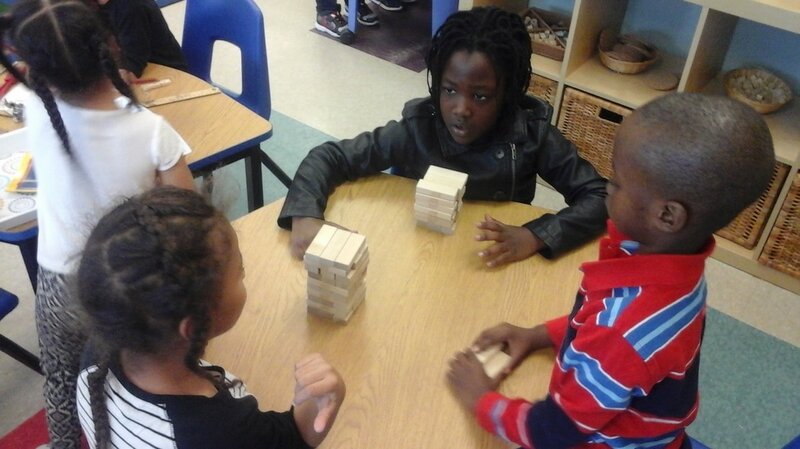 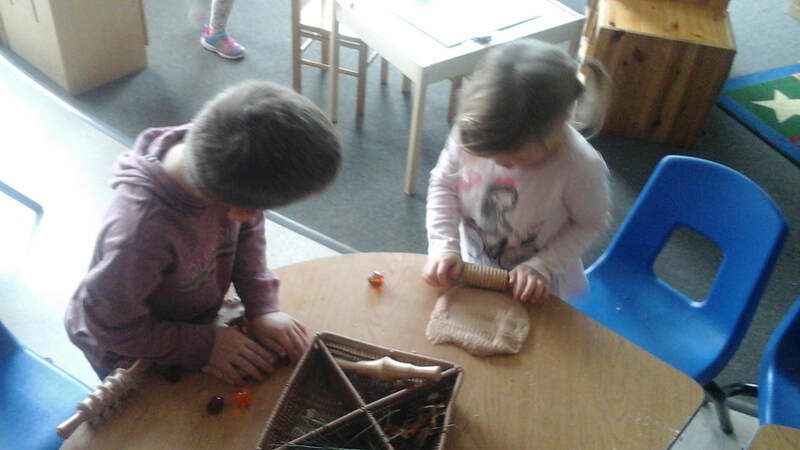 The following are photos of our Kindergarten B Friends in play during the months of September and October. 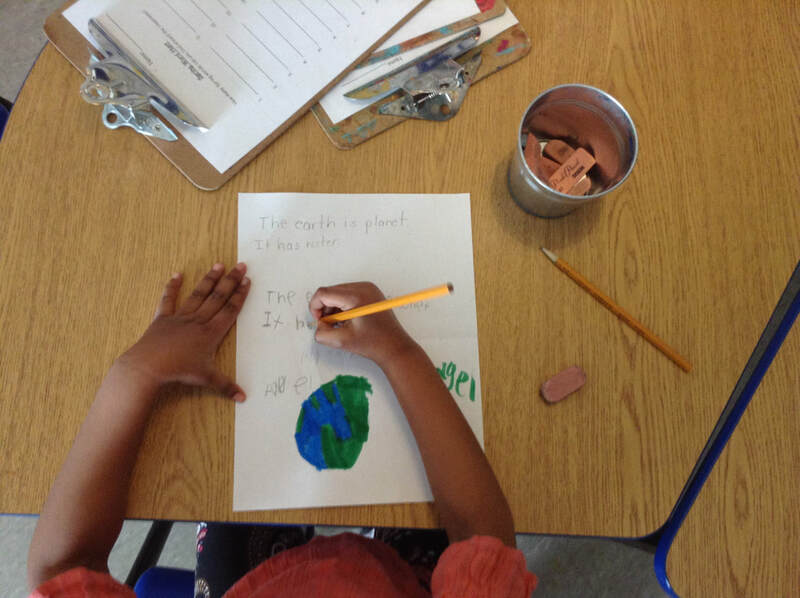 The end of year is fast approaching and there has been a lot happening in Kinder B! 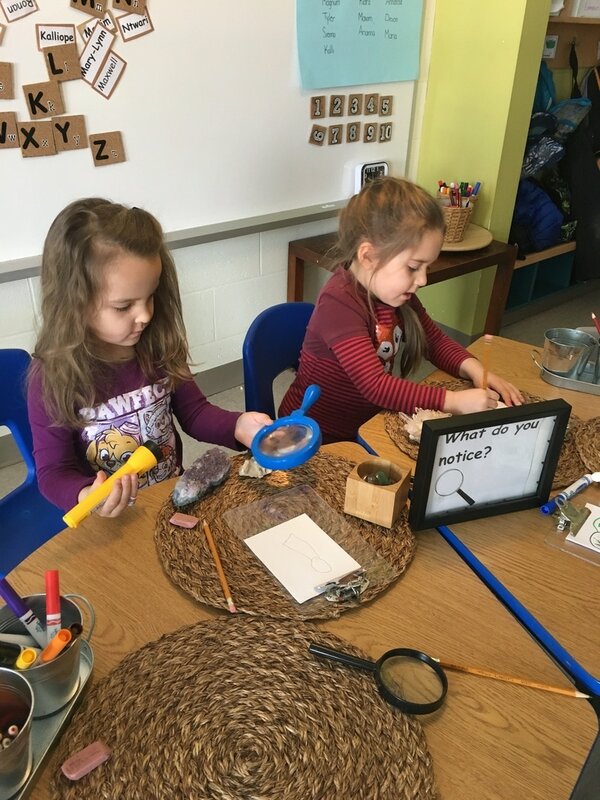 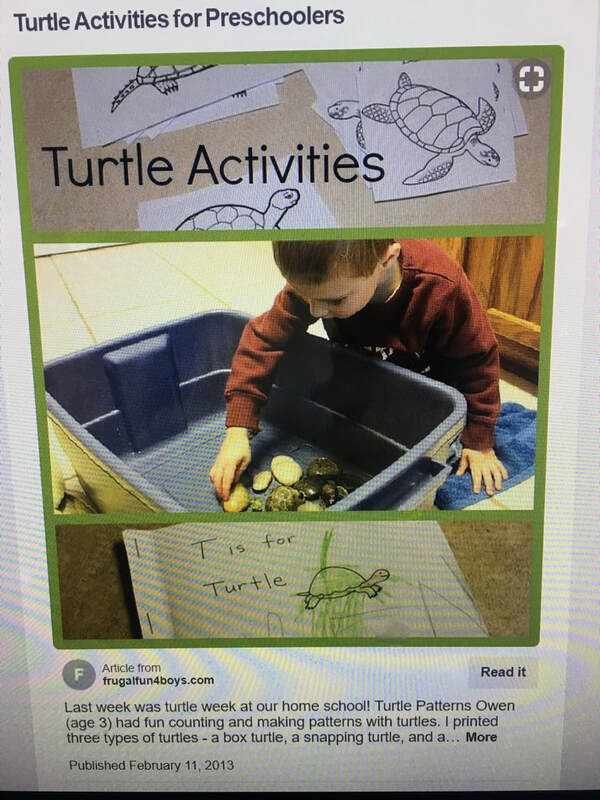 We have been continuing to learn about different jump out words (sight words) as well as learning about rhyming words and syllables. 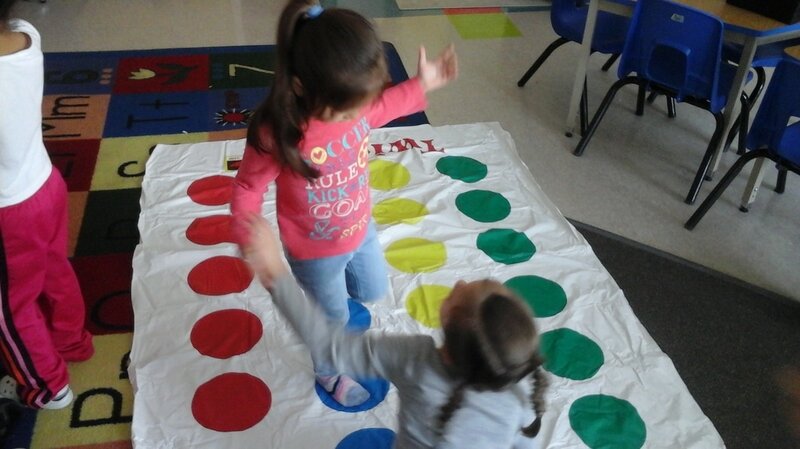 We have been listening to different songs as well as playing games in small and large groups and on the Smart Board. 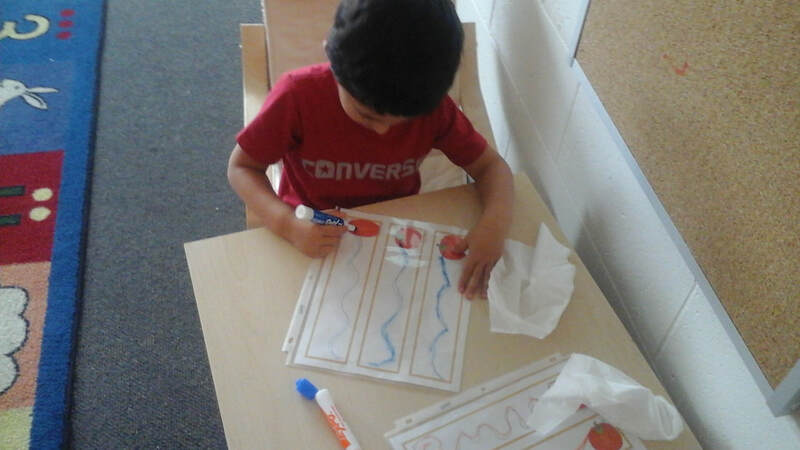 In art we have been learning about different types of lines and how we use different lines and shapes to make our art pieces. 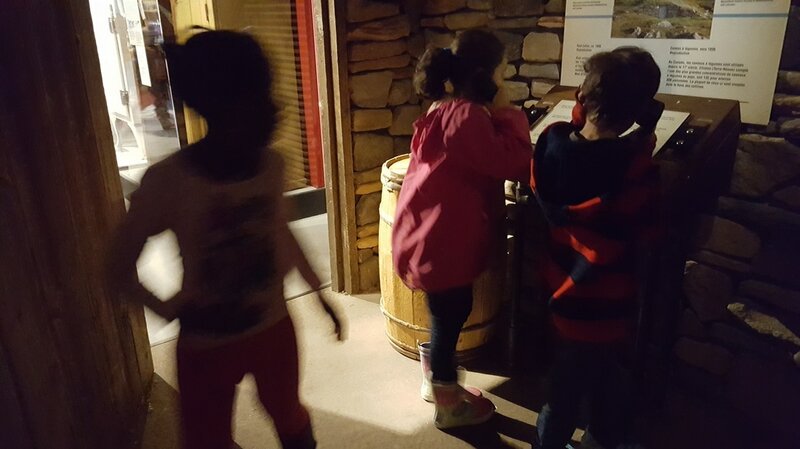 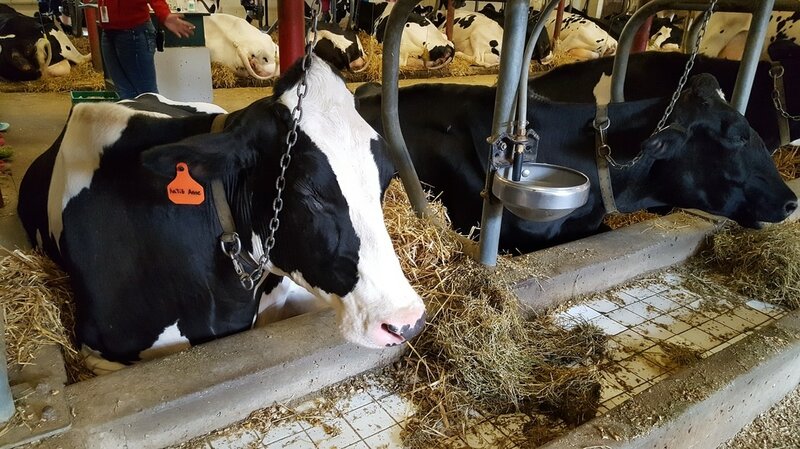 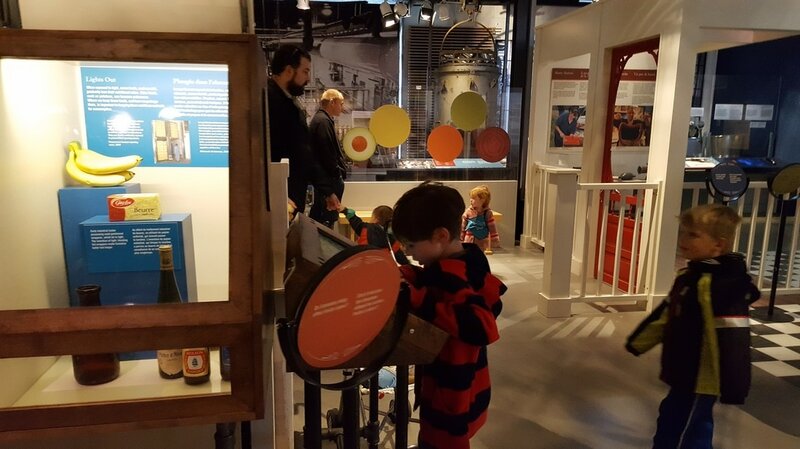 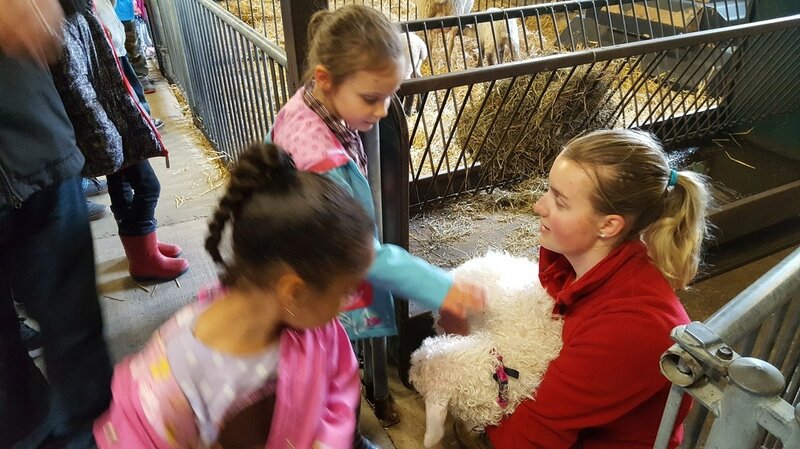 Last week we went on our trip to the Museum of Agriculture. 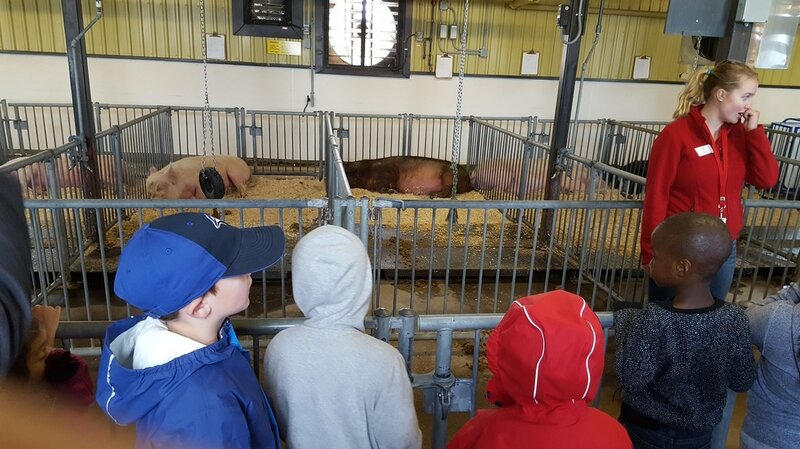 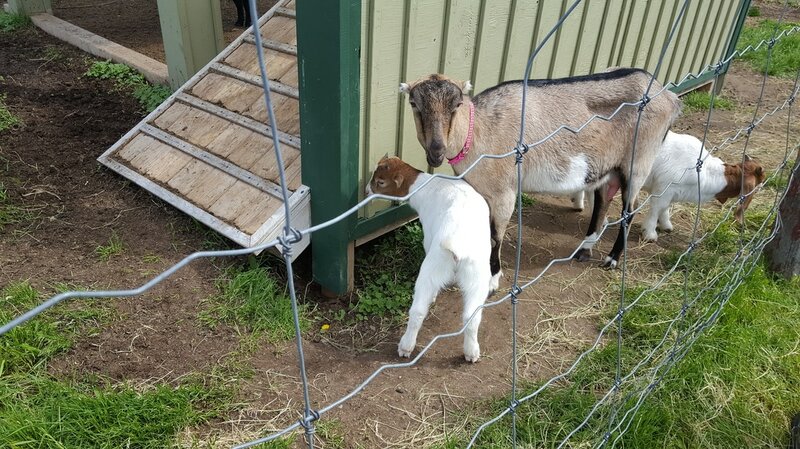 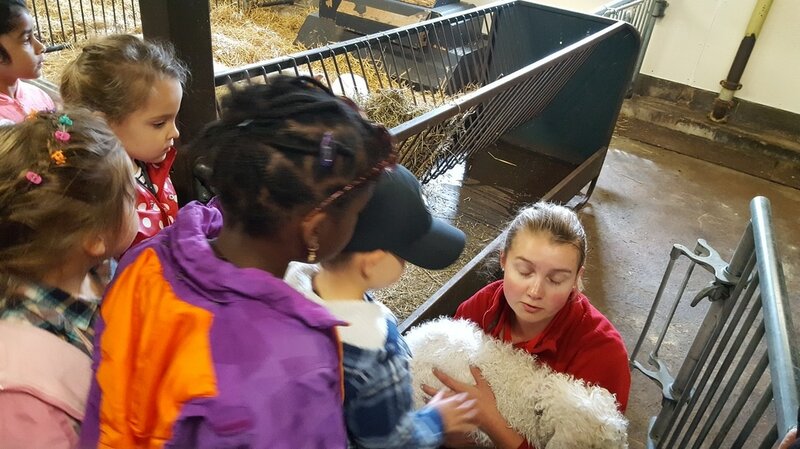 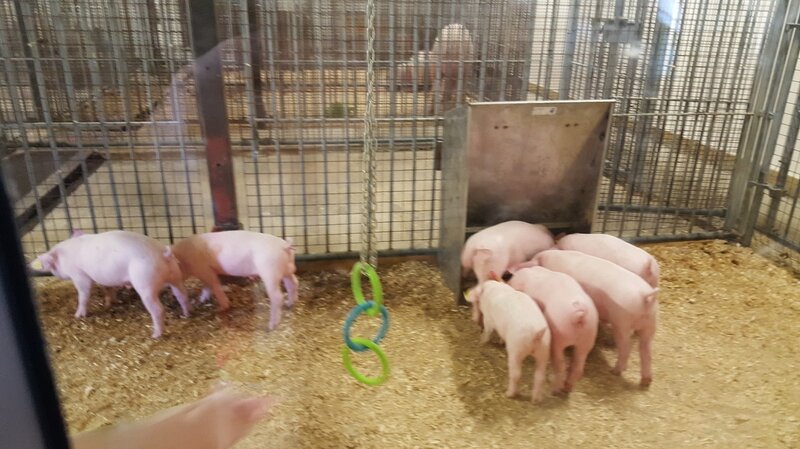 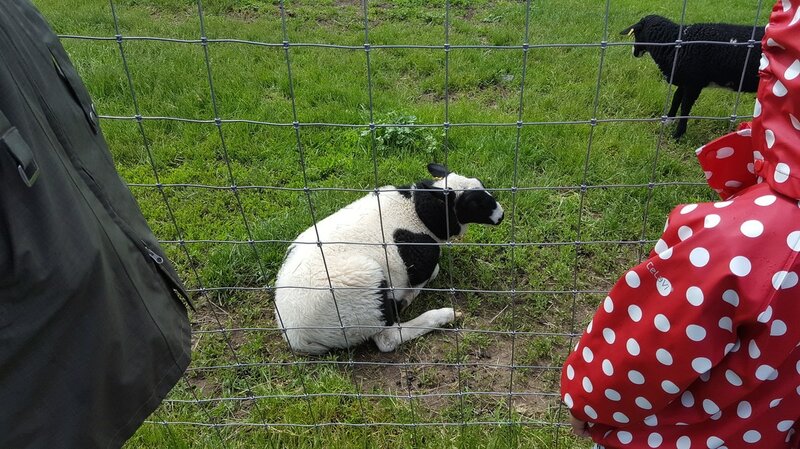 We were able to see lots of different animals on the farm and learn all about them. 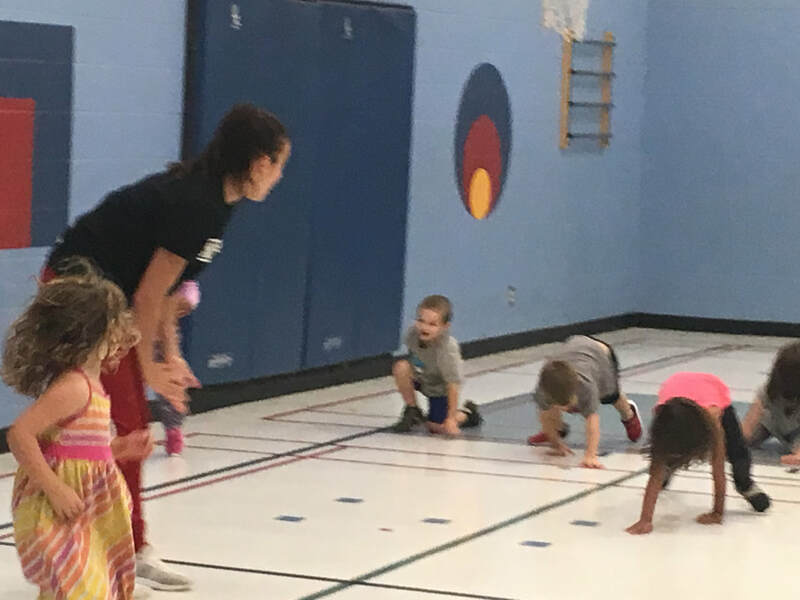 Thank you to all the parent volunteers that joined us! 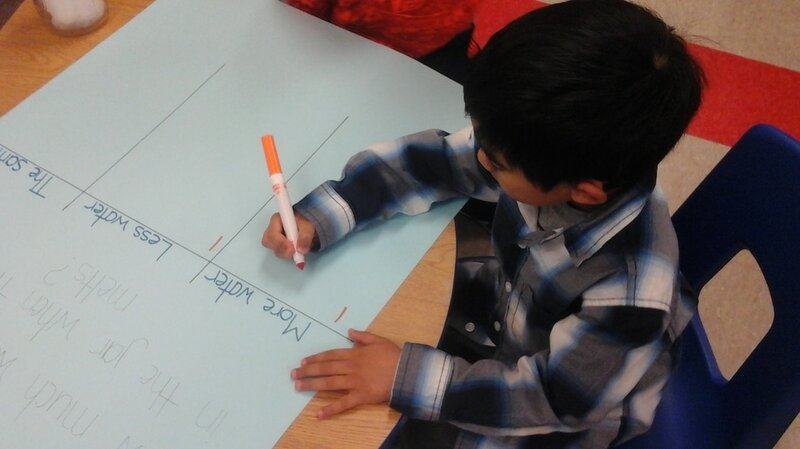 In numeracy we have been learning about graphing and tallying. 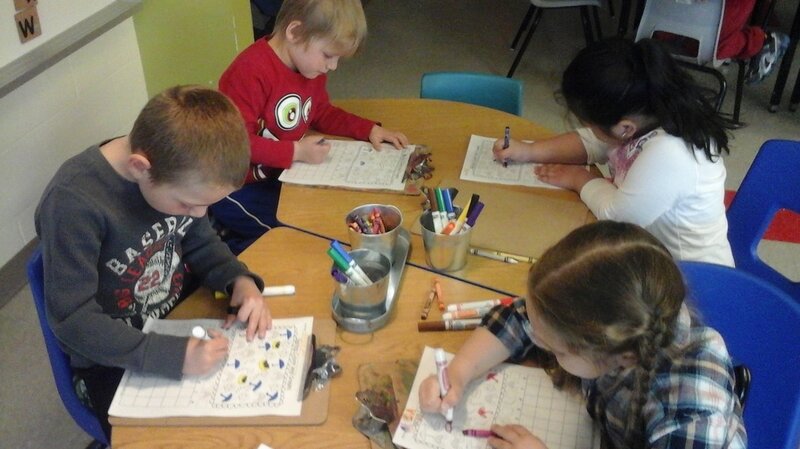 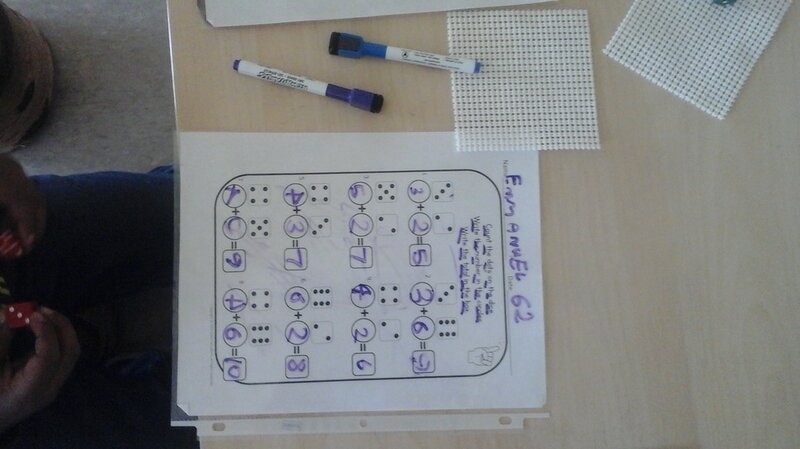 We have also continued with subitizing and addition. 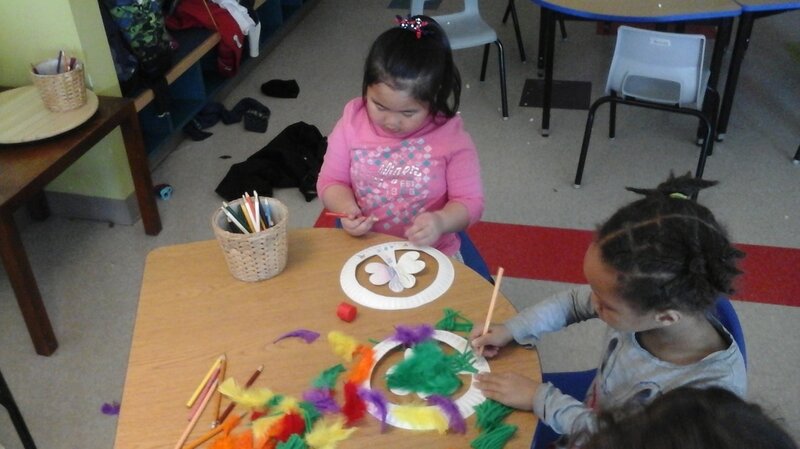 In Science we have been continuing to learn about our butterfly life cycle. 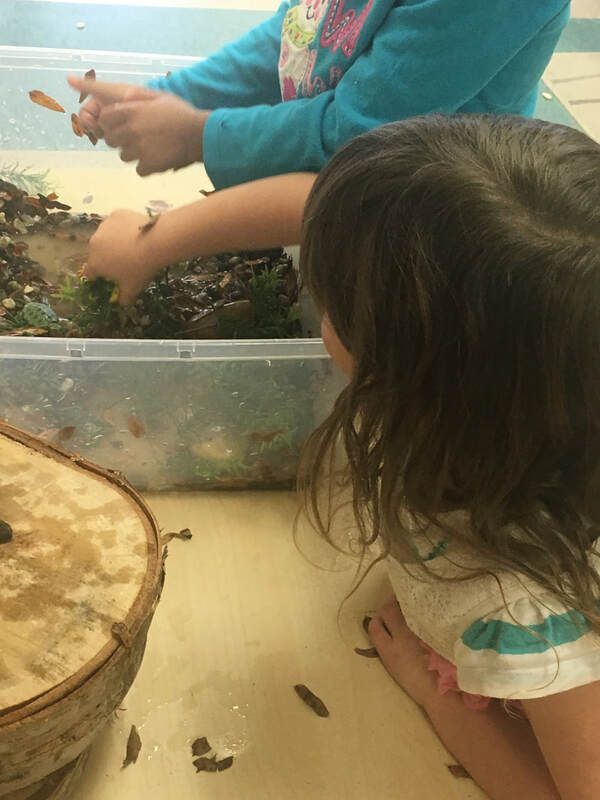 We watched our caterpillars turn into their chrysalis and then we were able to watch them hatch into butterflies! 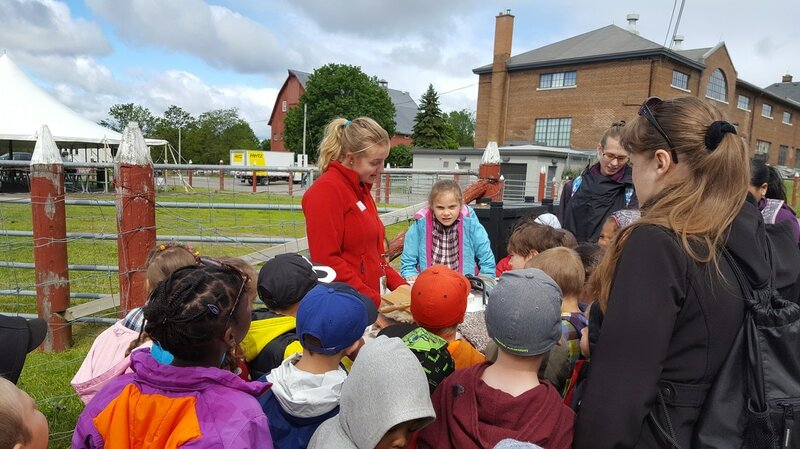 We then released them back into nature. 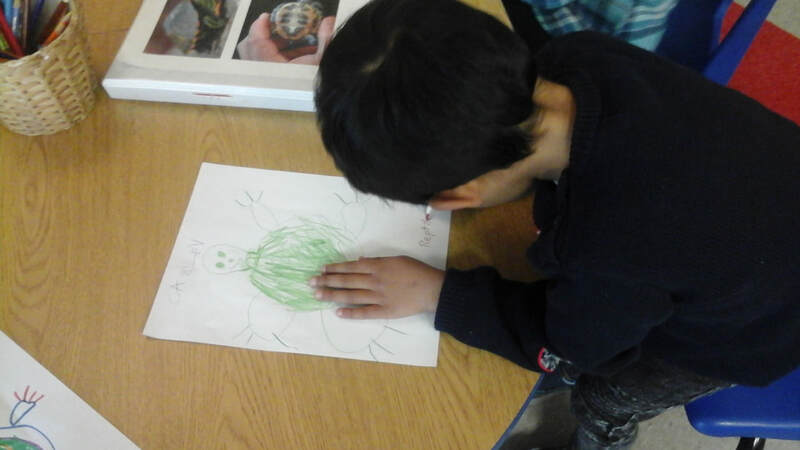 With all the rain some of the children had lots of questions about worms. 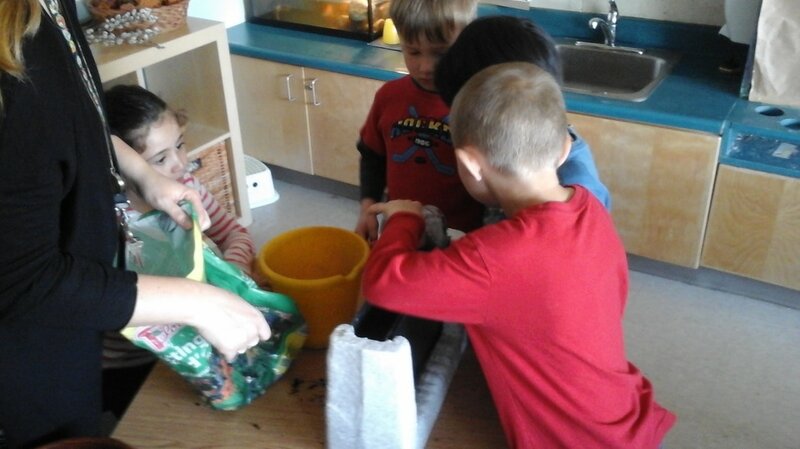 So we collected some from our yard and put them inside our special worm house. 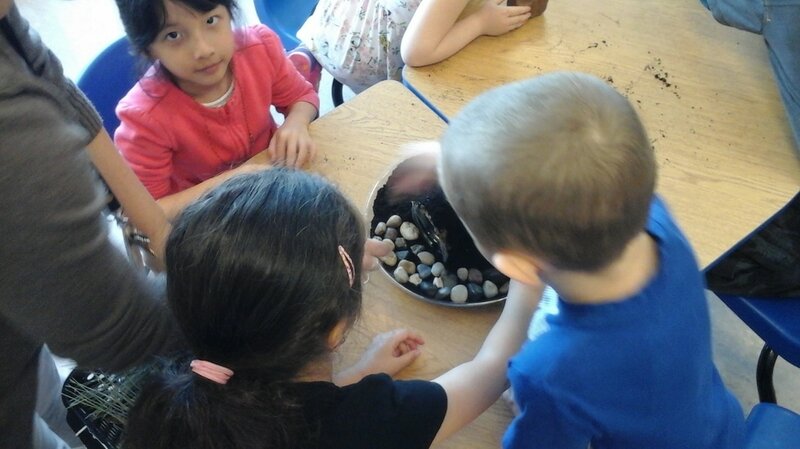 We used our special worm house to observe our worms and see how they make their tunnels. 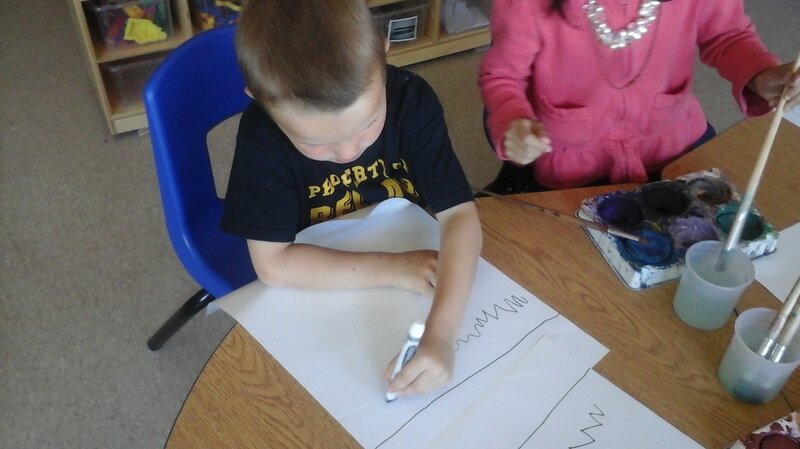 We did a science experiment about plants and how they drink water. 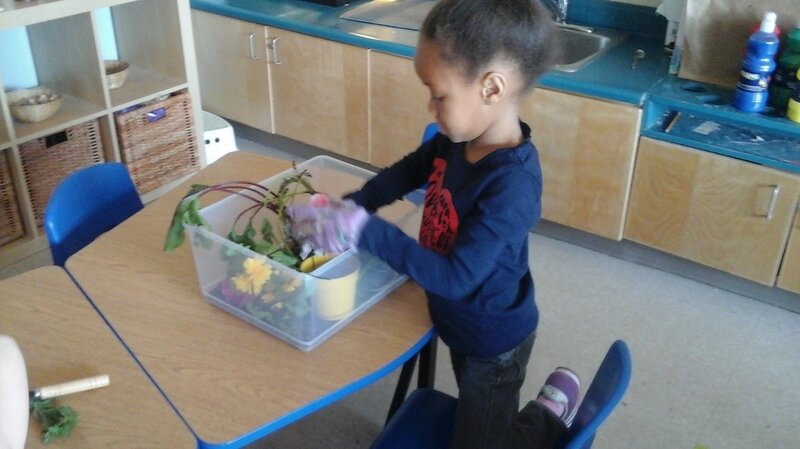 We took some white flowers and placed one flower into a different container of food colouring. 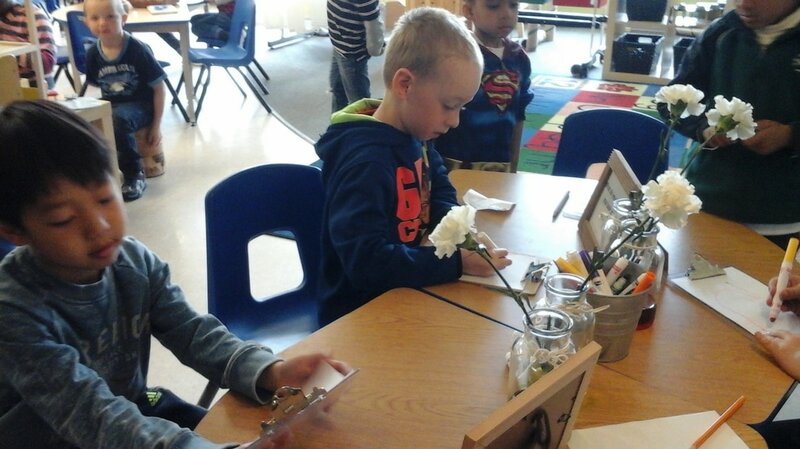 We then recorded what we thought would happen to the flowers. 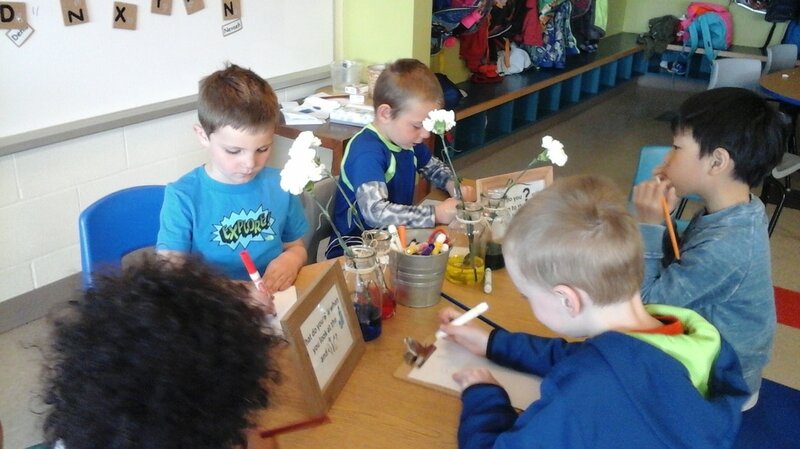 We learned that flowers use their stems to "drink" the water and because they were drinking up the coloured water their white petals turned the same colour as the water! 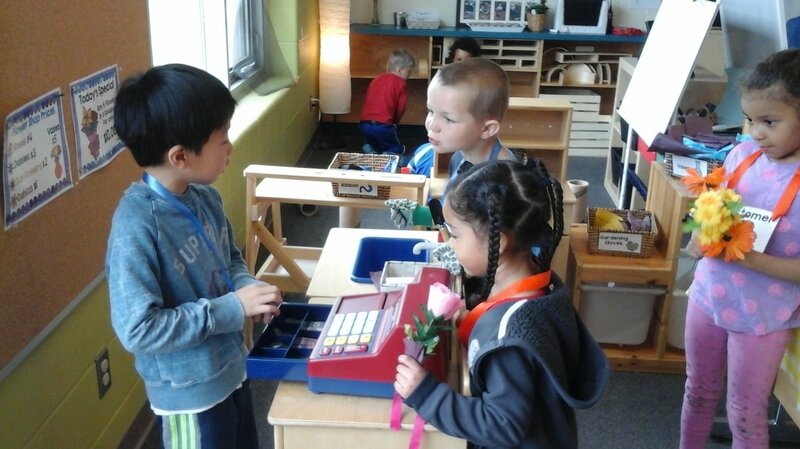 In our dramatic play centre, we opened up a flower shop. 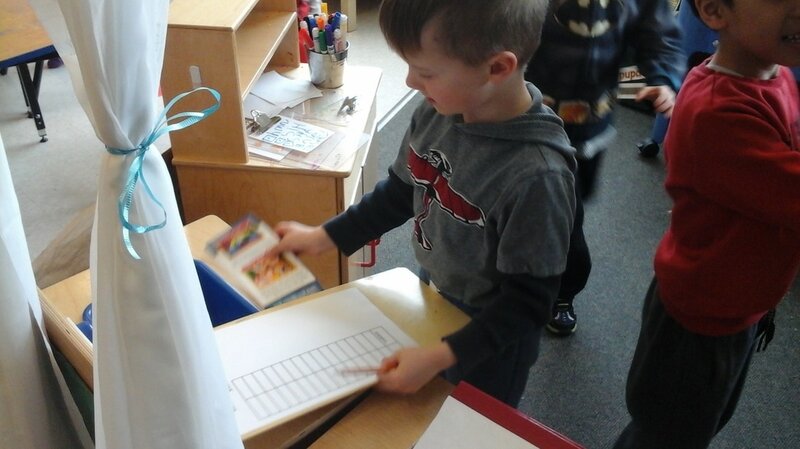 The children took turns being the customer and the cashier. 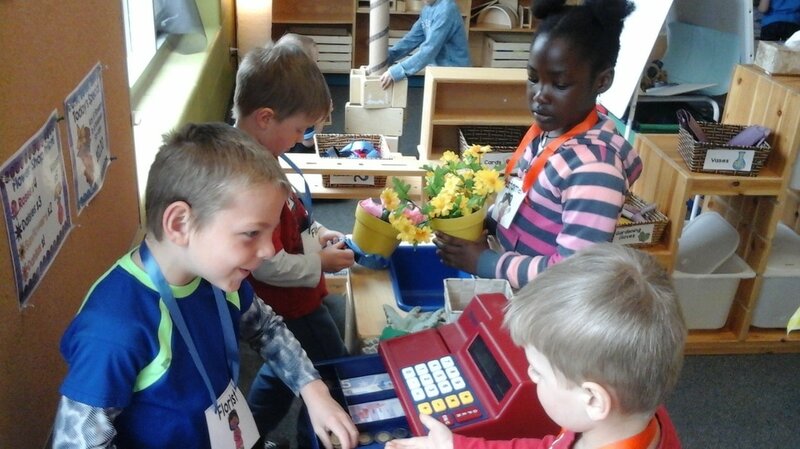 The children wrapped their bouquets and then sold them to the customers using pretend coins. 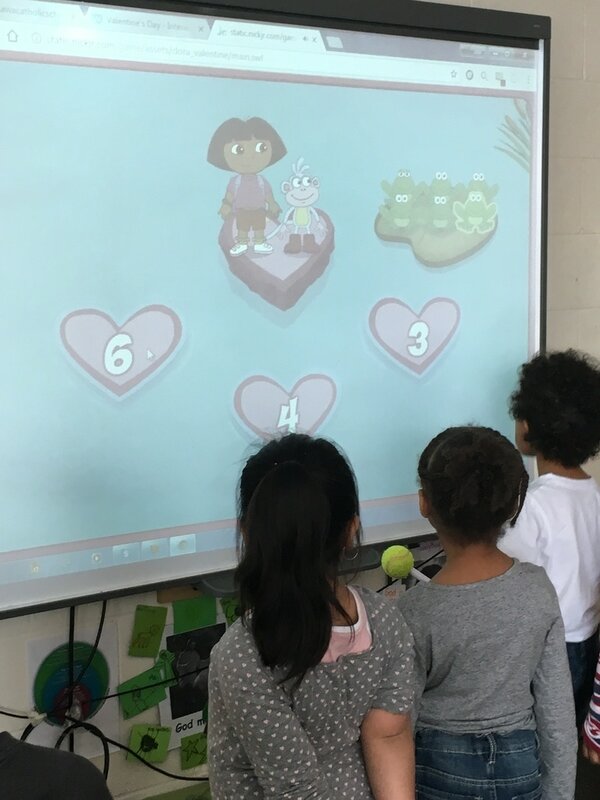 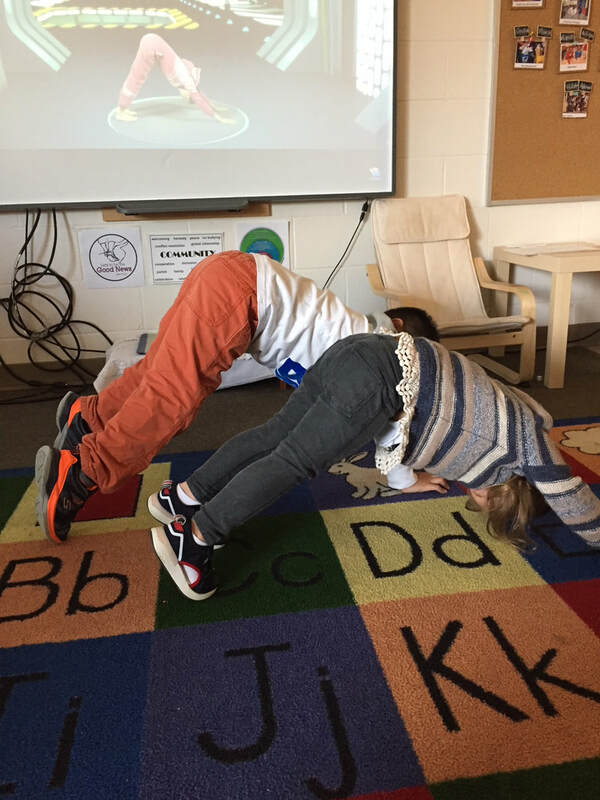 The children learned about our Canadian coins during this play and using interactive games on the Smart Board. 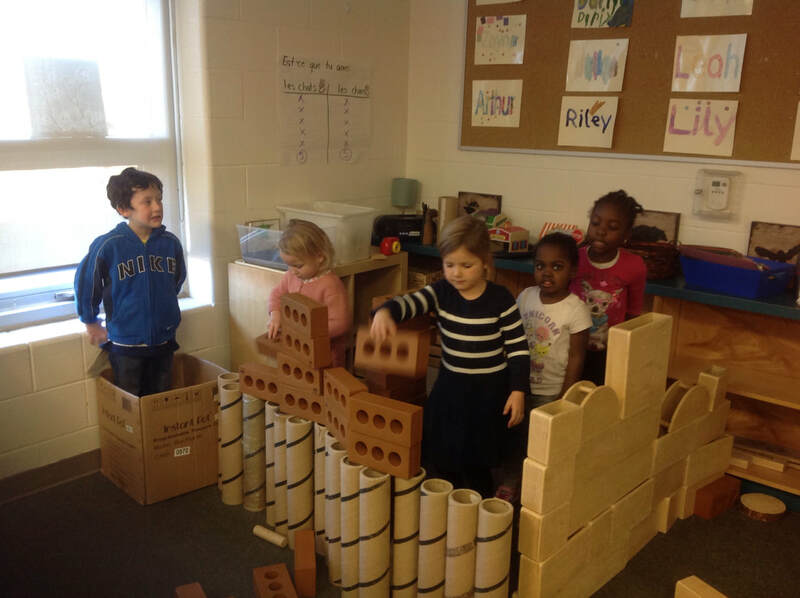 There has been lots of fun things happening in Class B the past few weeks! 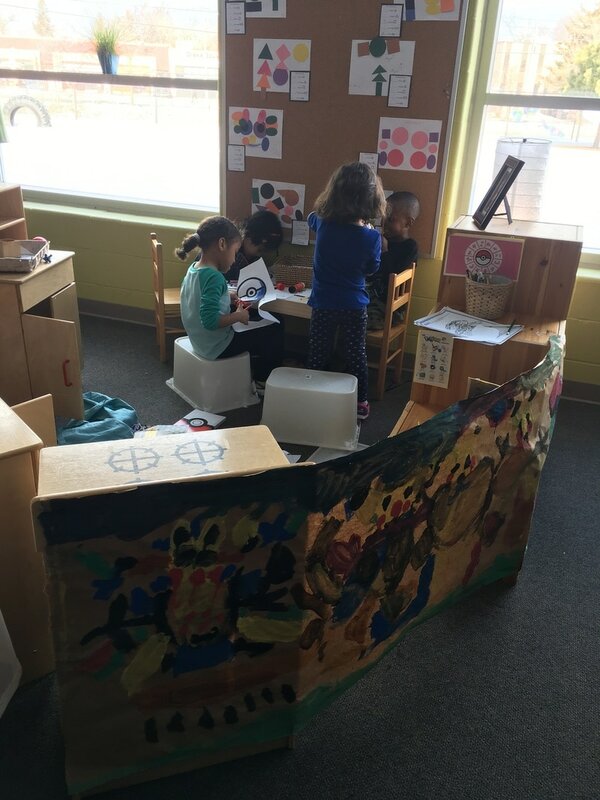 The children decided they wanted to turn our dramatic play area into a Butterfly Field. 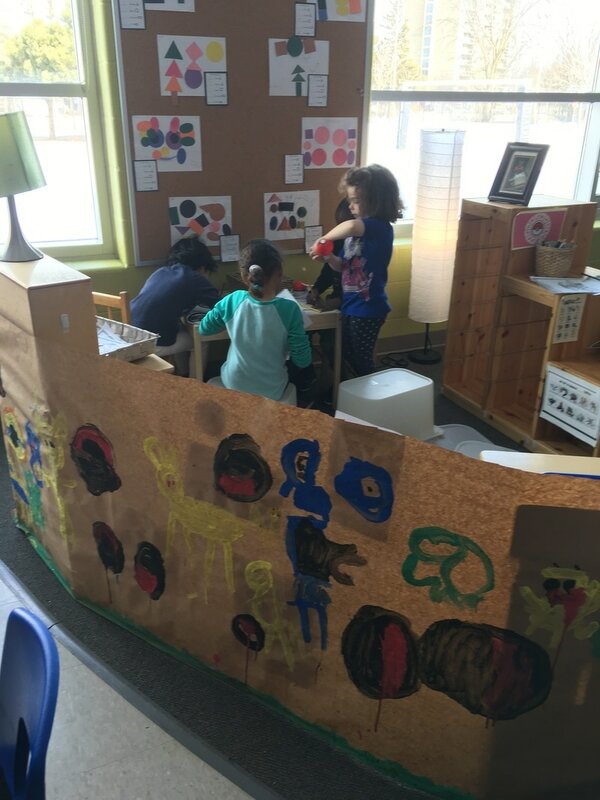 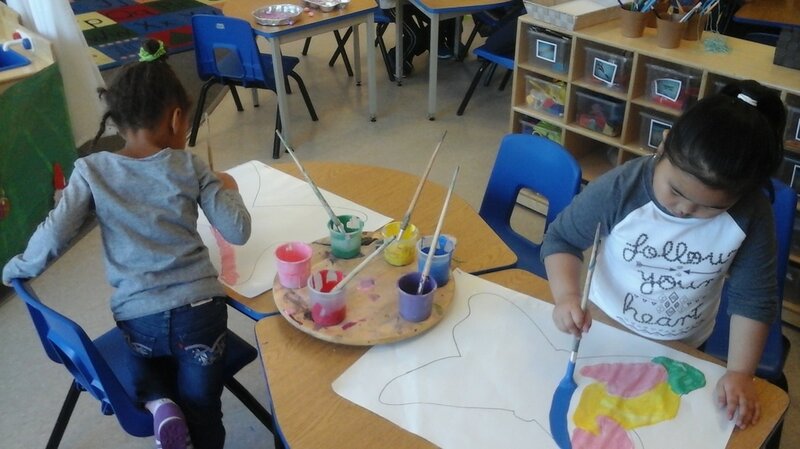 They had lots of fun painting the mural and butterflies to decorate the dramatic play area. 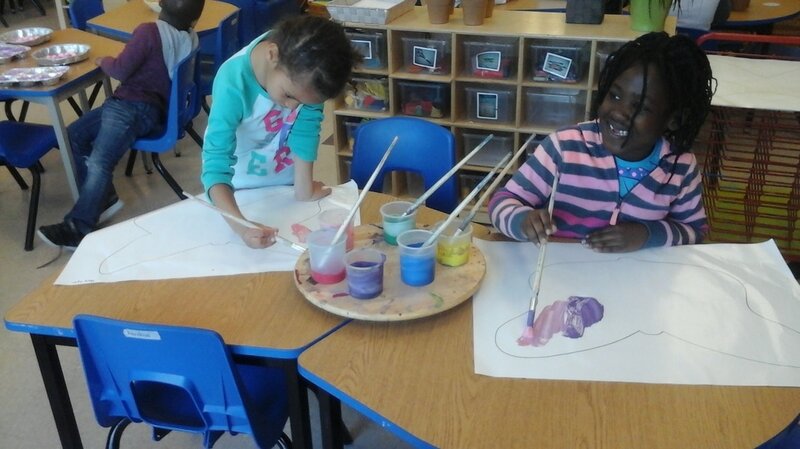 We learned about symmetry while painting our butterflies. 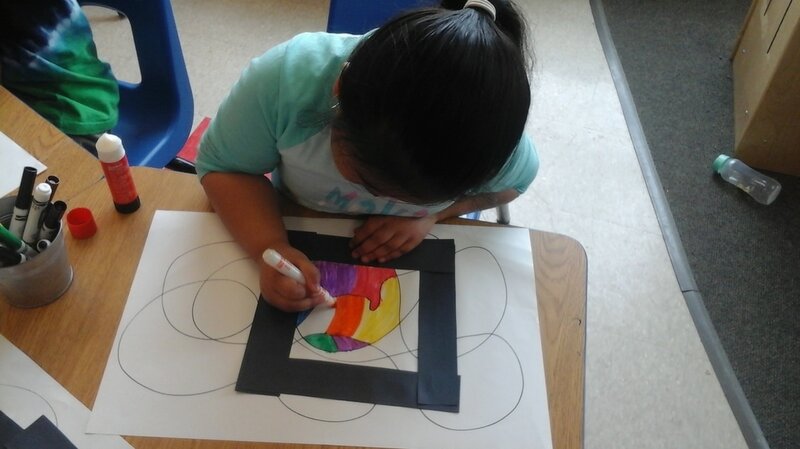 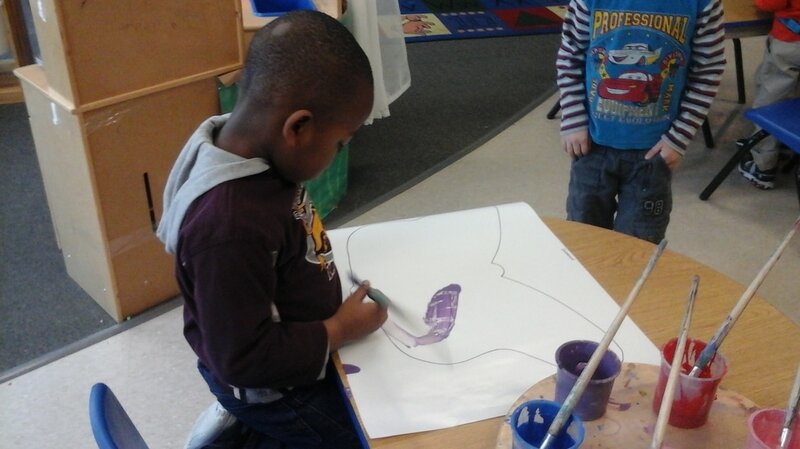 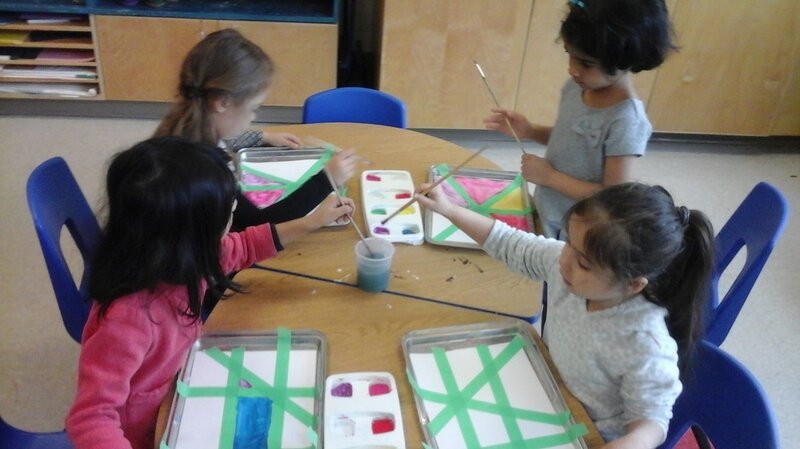 We learned that if we paint one side of the butterfly and fold it over then both sides will be the same! 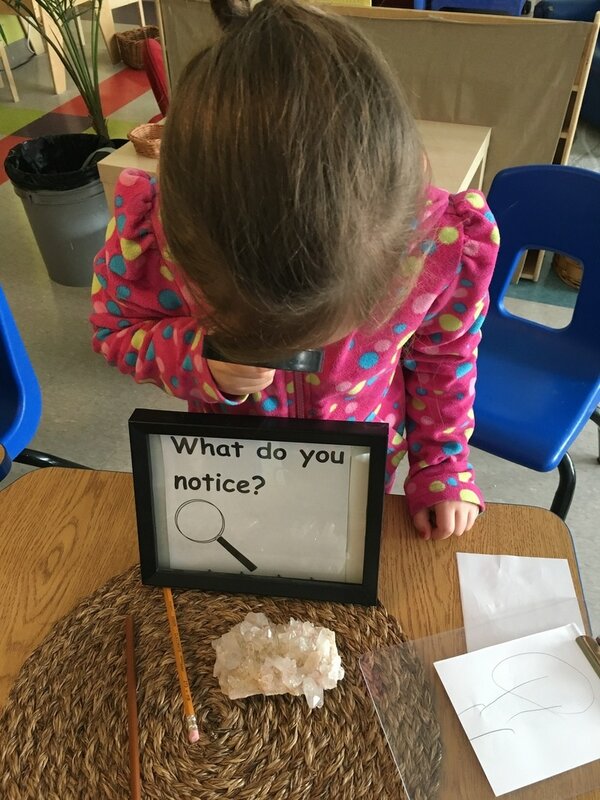 We have also been learning about the life cycle of the butterfly and will hopefully get to watch the life cycle in action soon when our caterpillars arrive in our classroom. 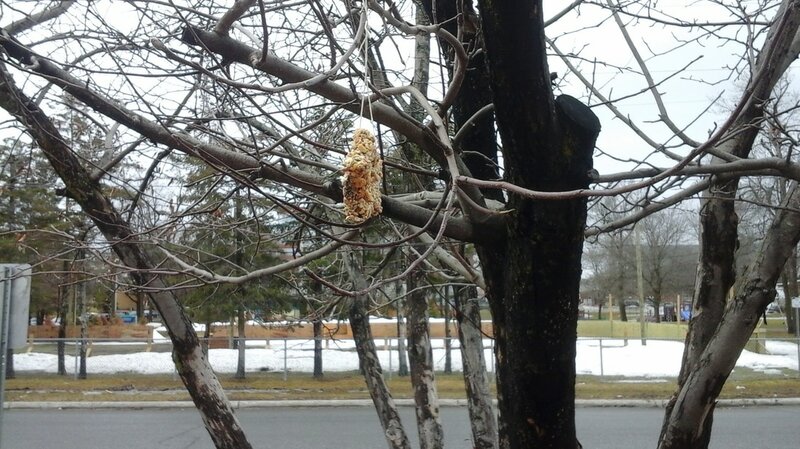 With the arrival of Spring and all of the birds returning for the Summer the children thought it would be fun to make bird feeders for the birds. 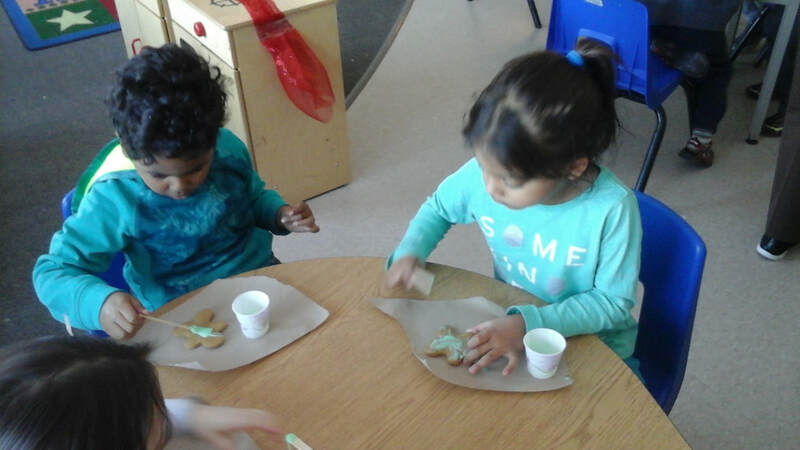 We made them using bird seed, flour and corn syrup and cut them into shapes using cookie cutters. 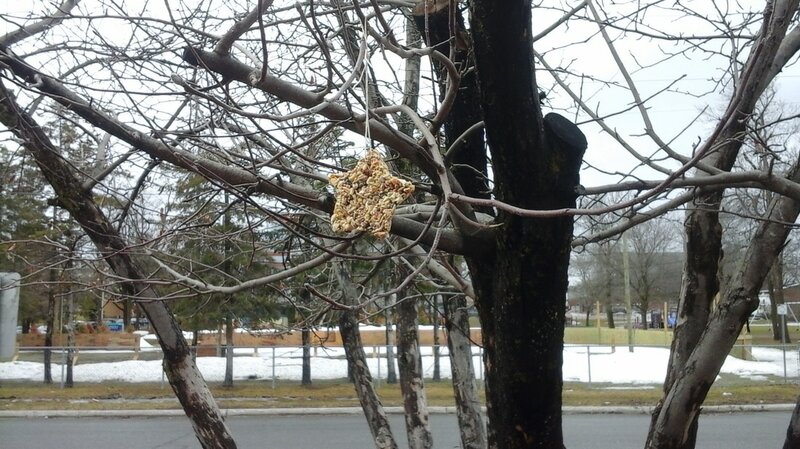 When then hung them outside in the trees for the birds to enjoy! 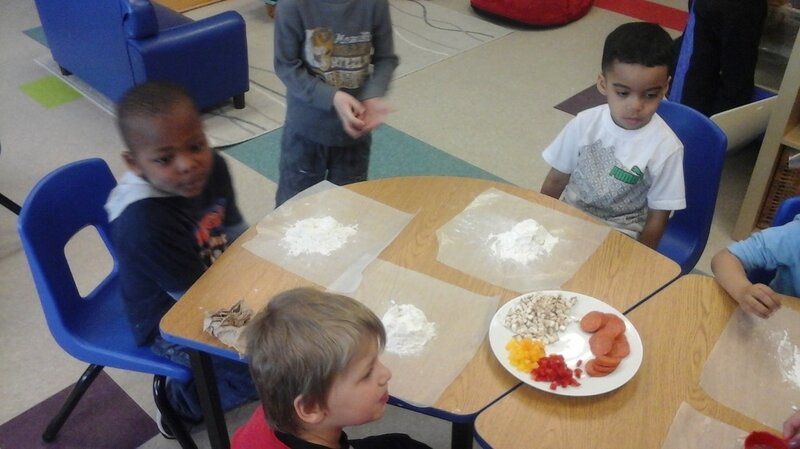 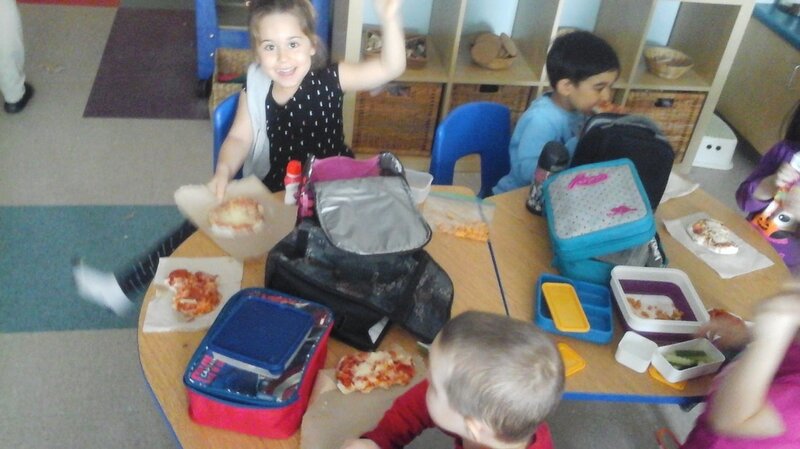 We had fun making our own individual pizza's. 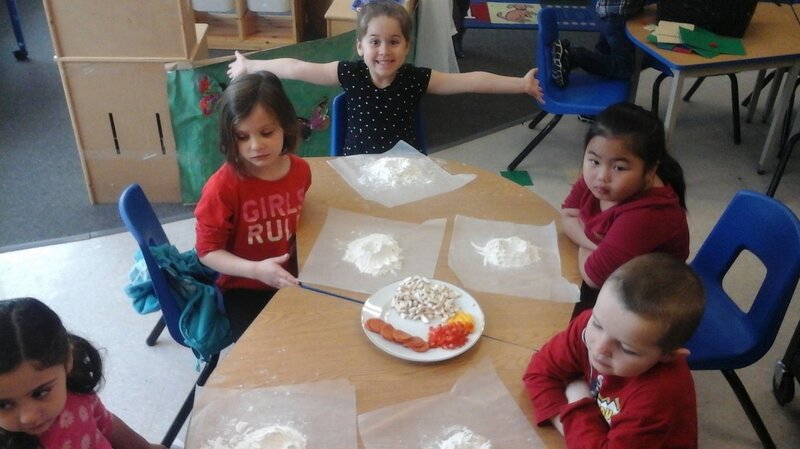 The children got to make their own dough from scratch and then choose from different vegetables for their toppings! 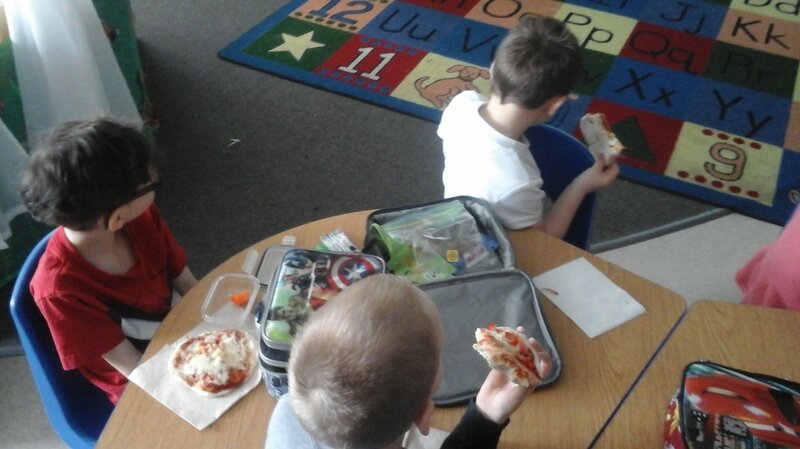 We then got to enjoy our homemade treat for lunch! 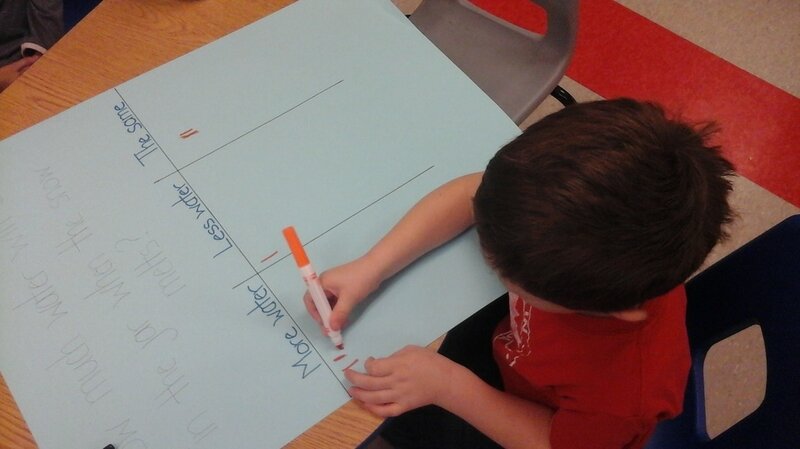 We have started learning about vowels, consonants, rhyming words and syllables. 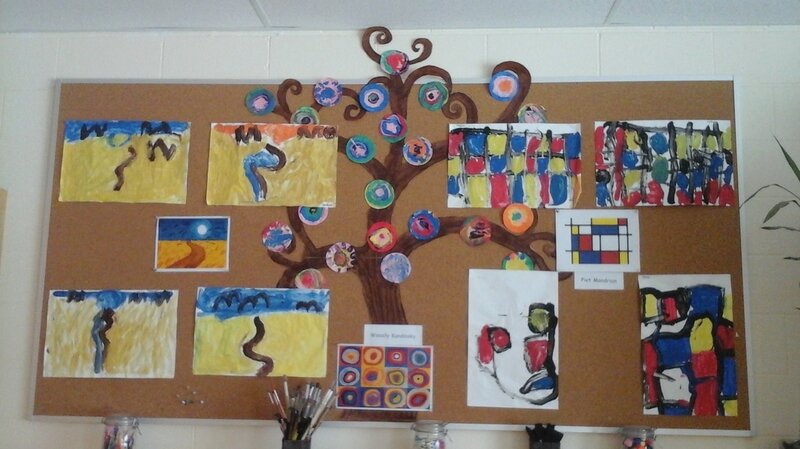 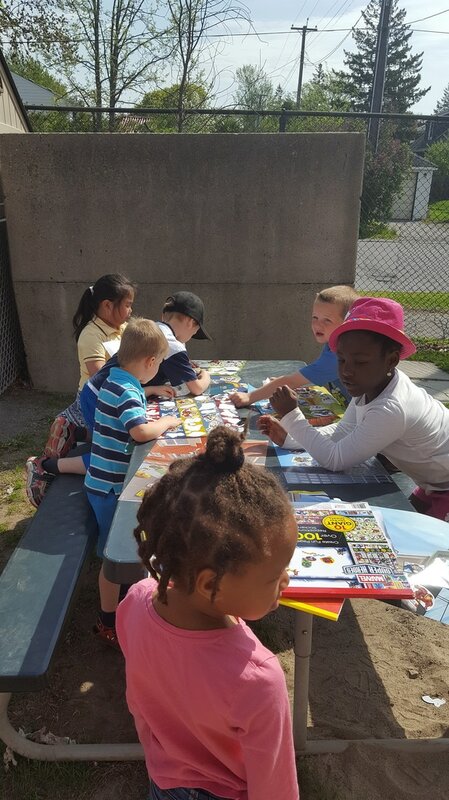 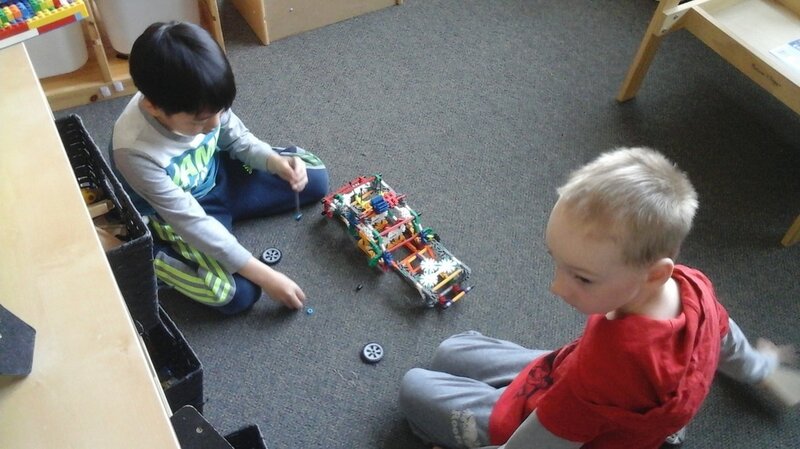 We have been working on these by participating in various activities during community time and during centres. 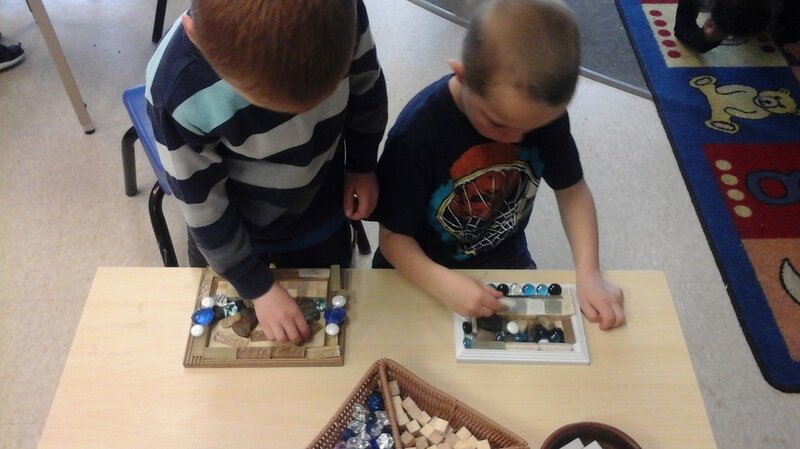 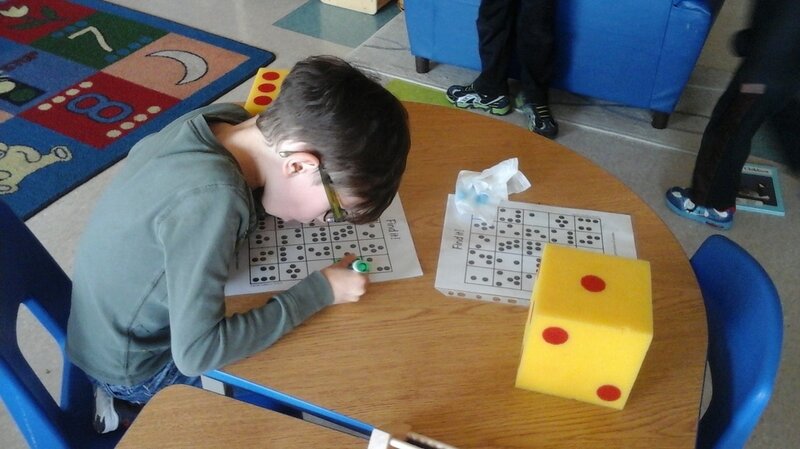 We have also been participating in different dice and domino games and learning how to recognize the amount of dots on the dice without having to count them (subitizing) . 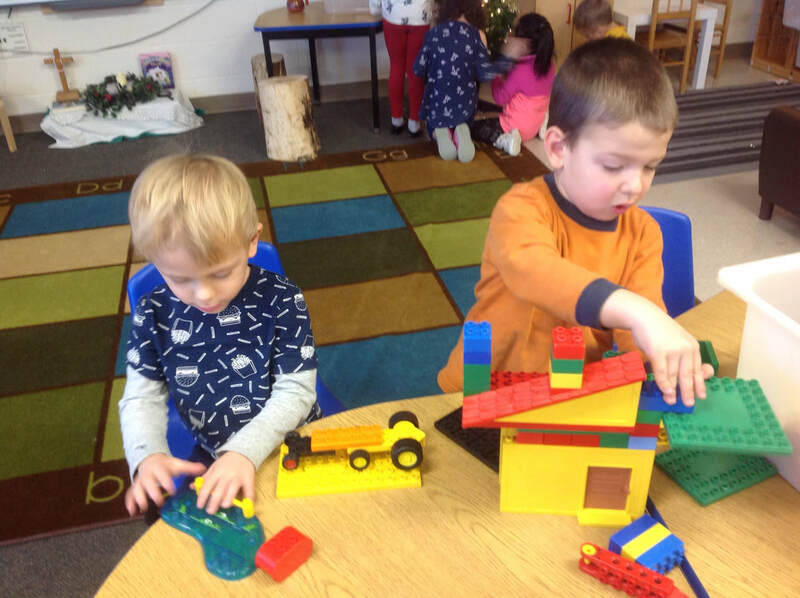 Here are a couple of videos we have been watching to help us learn. 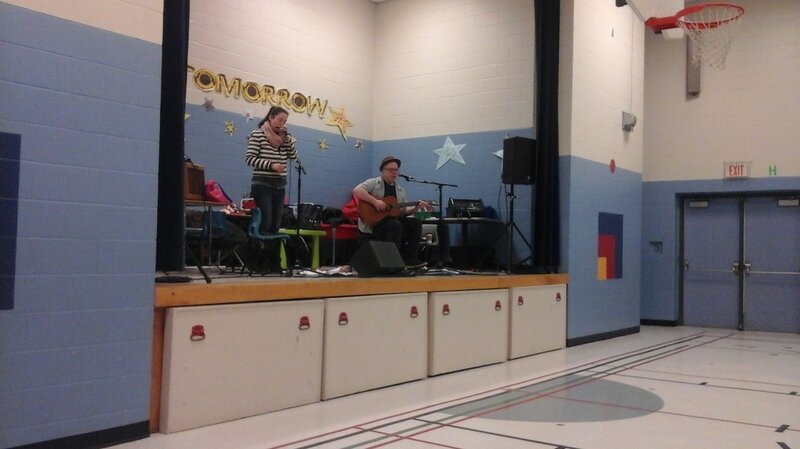 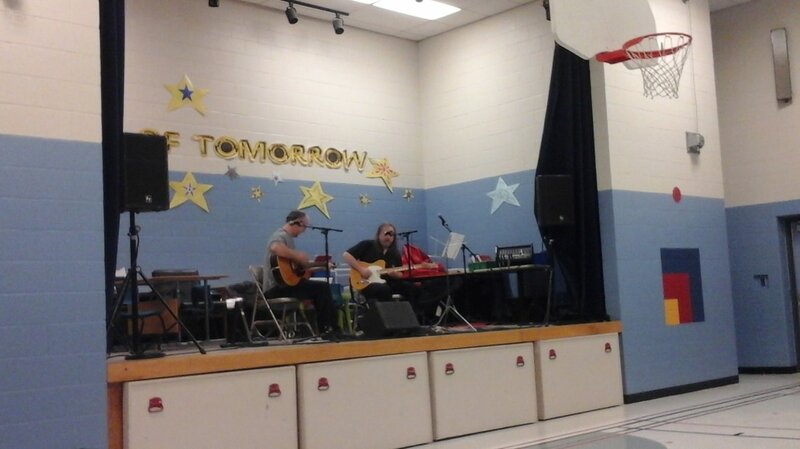 Our Lady of Fatima school hosted a presentation by the MASC. 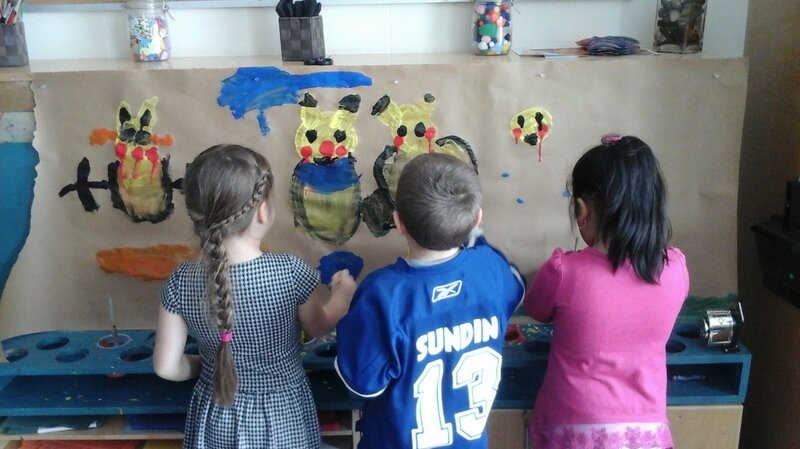 This group is an arts organization in Ottawa. 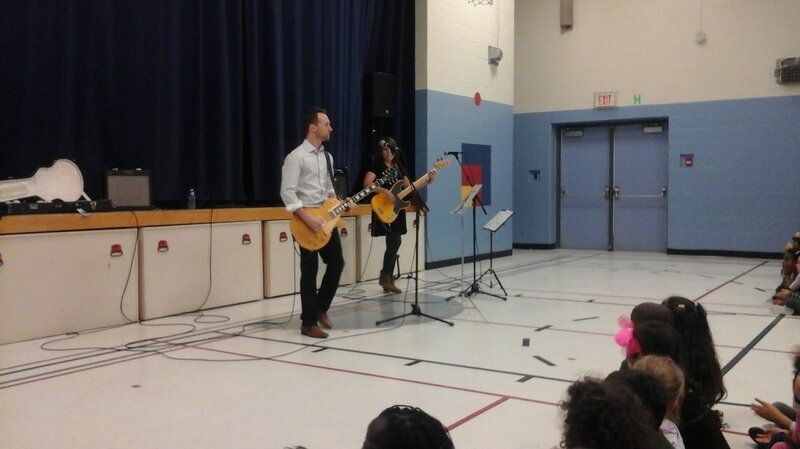 The group put on a show for our children. 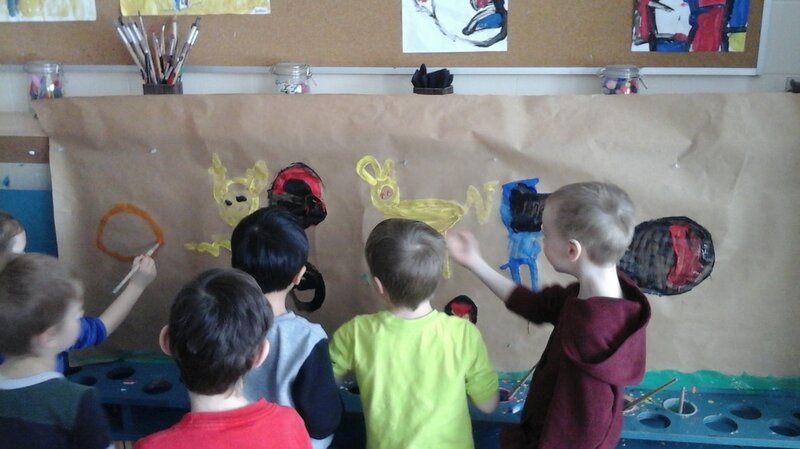 They were quite captivated by the show and the artists. 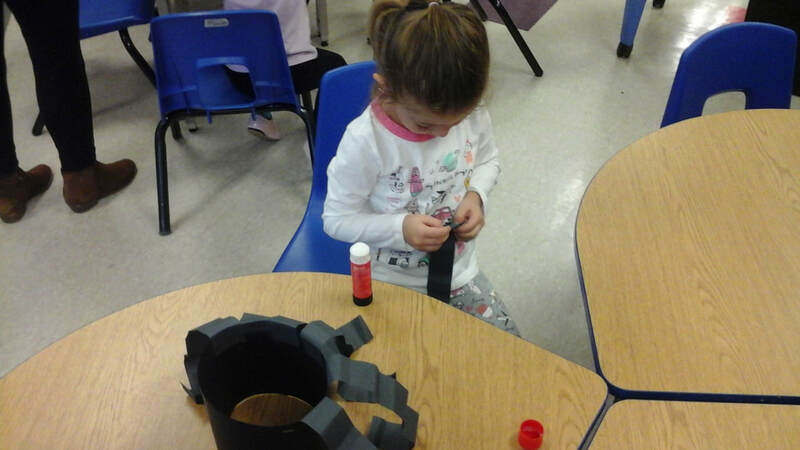 We had the pleasure to have a parent volunteer named Anna Baksheeva visit our classroom. 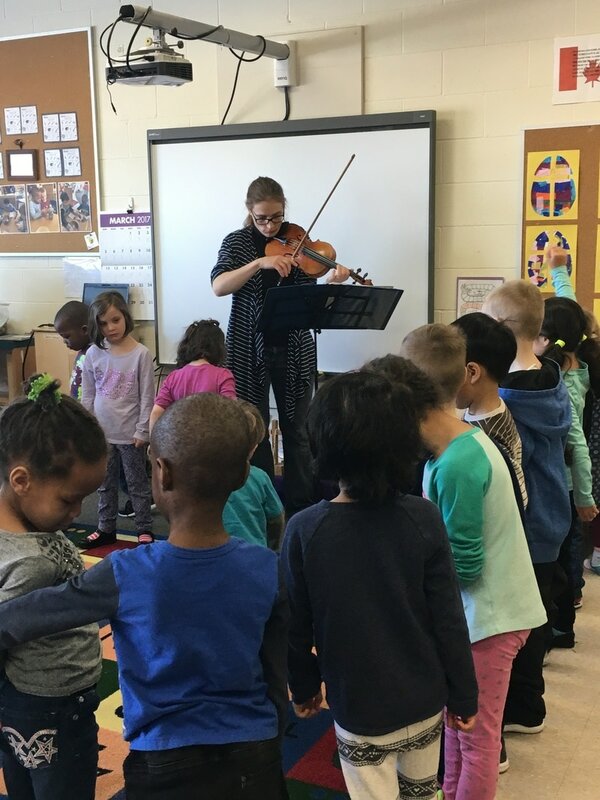 She plays the violin and came into the classroom to play a few songs for the children. 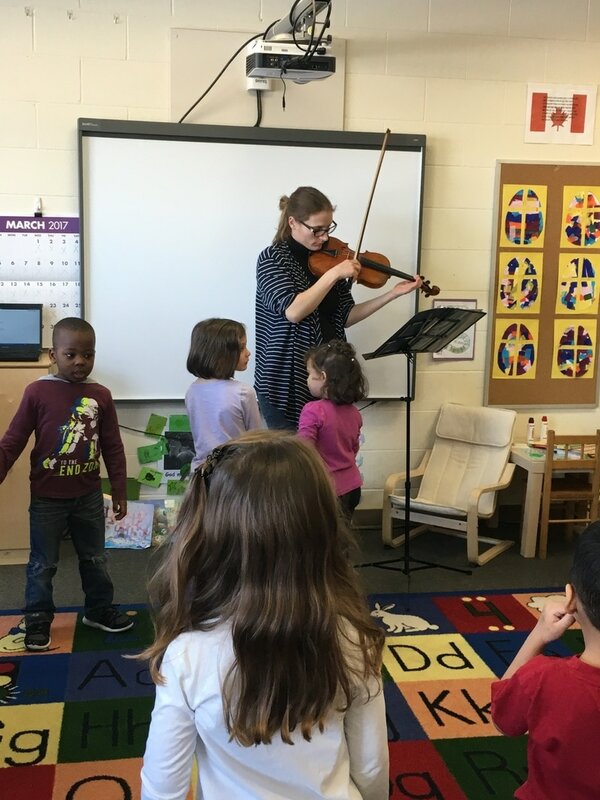 The children then had an opportunity to try out Anna's violin. 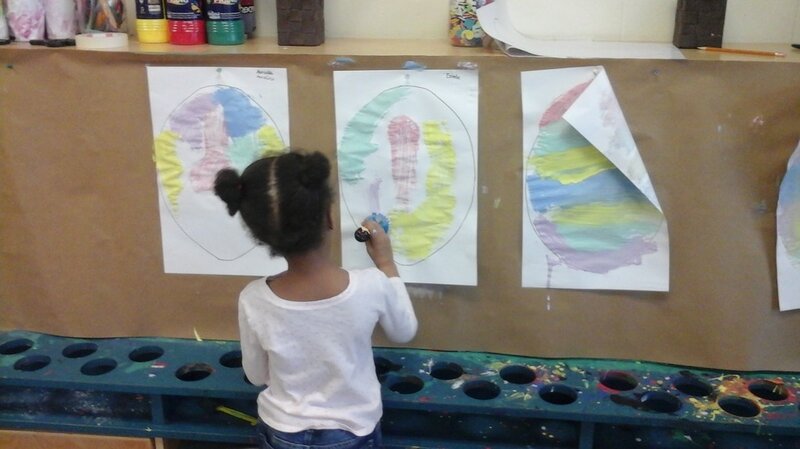 We hope everyone had a very Happy Easter with family and friends. 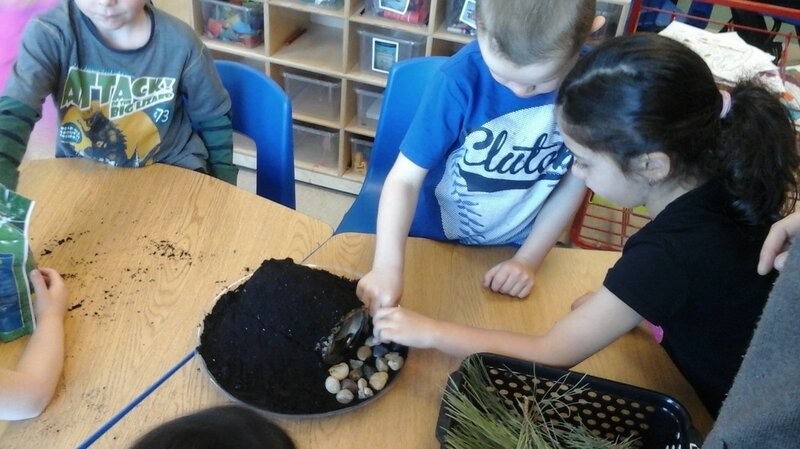 We made a Resurrection garden for our prayer table and talked about the Easter story. 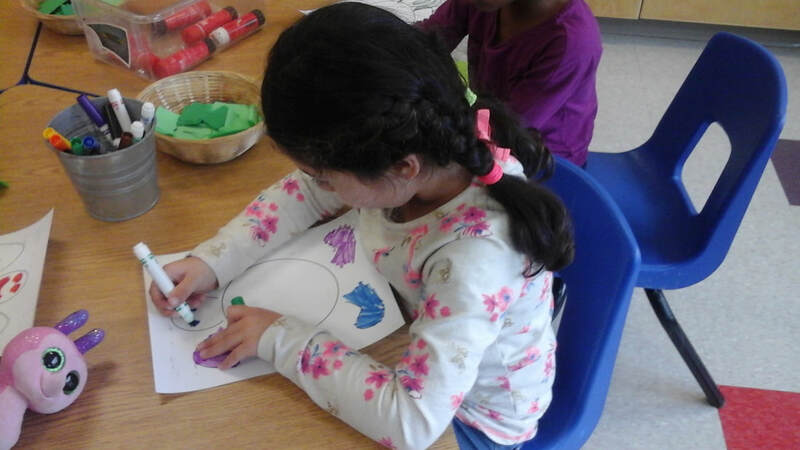 We also had our Priest Father Tavis come into our class for a visit and talk to us about Easter and answer any questions that we had. 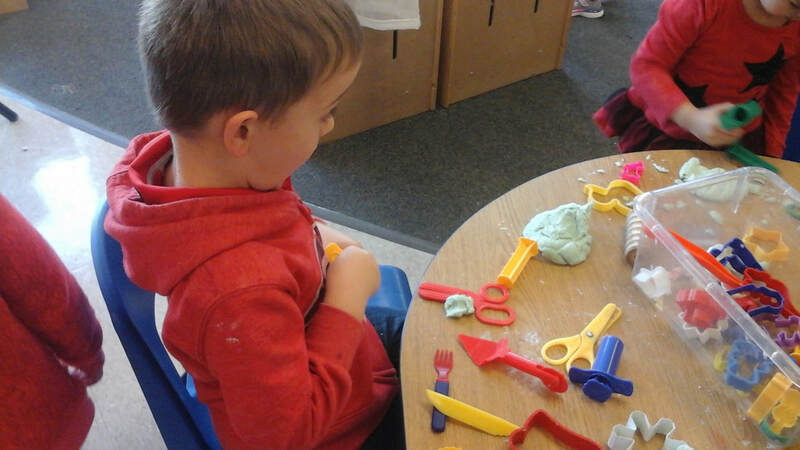 We have had many different Easter activities set out for the children to explore and participate in. 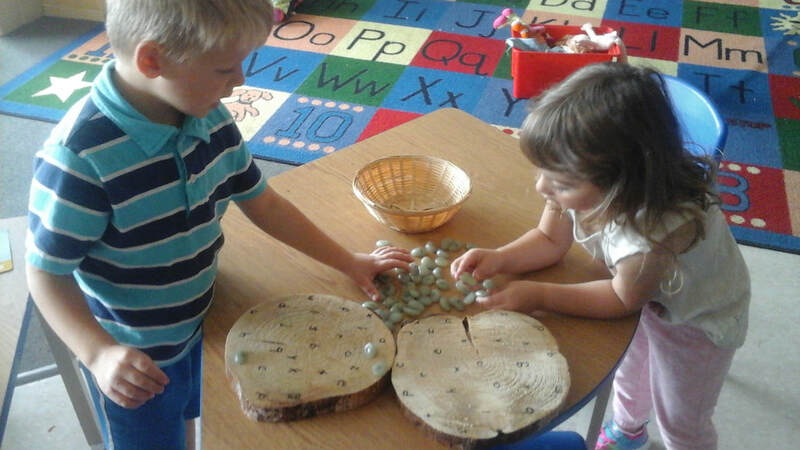 This week our chicken eggs came into the classroom! 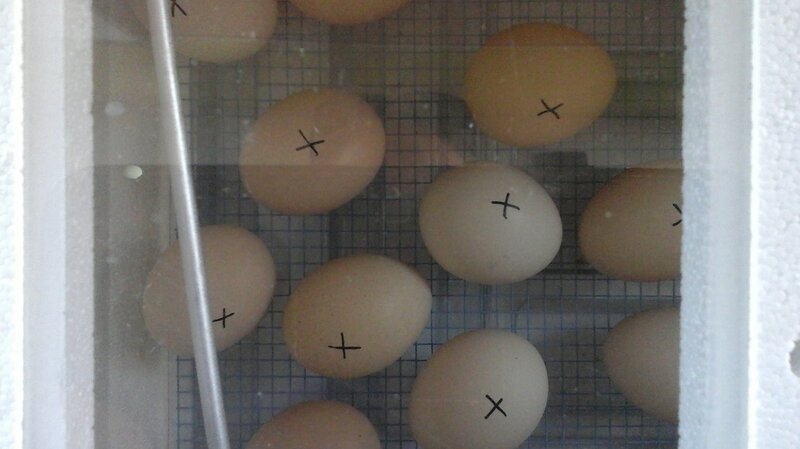 They are growing inside the incubator where it is nice and warm. 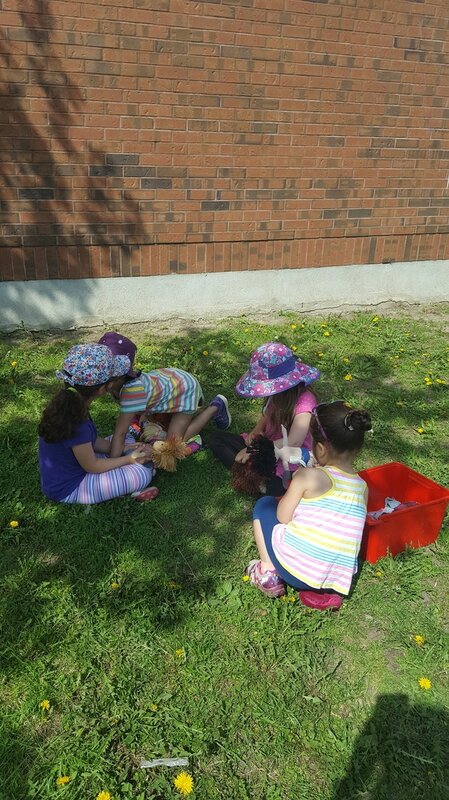 We have started talking about chickens and where they come from and how they grow inside of the eggs. 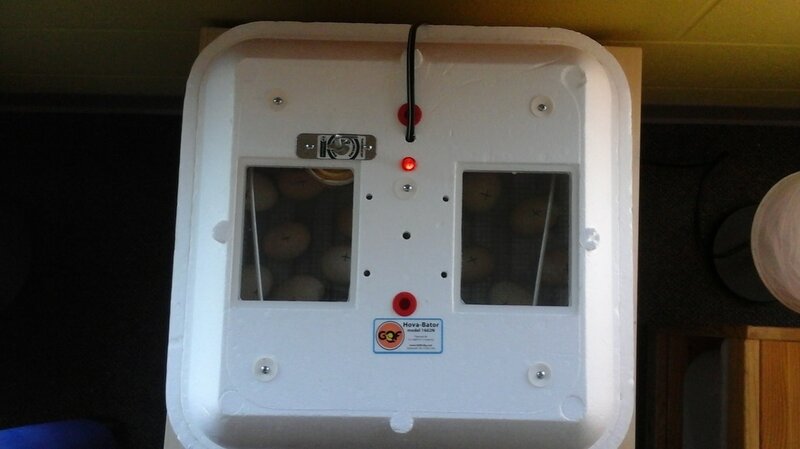 We have also started talking about how they hatch and what they use to break out of their egg when they are ready to come out. 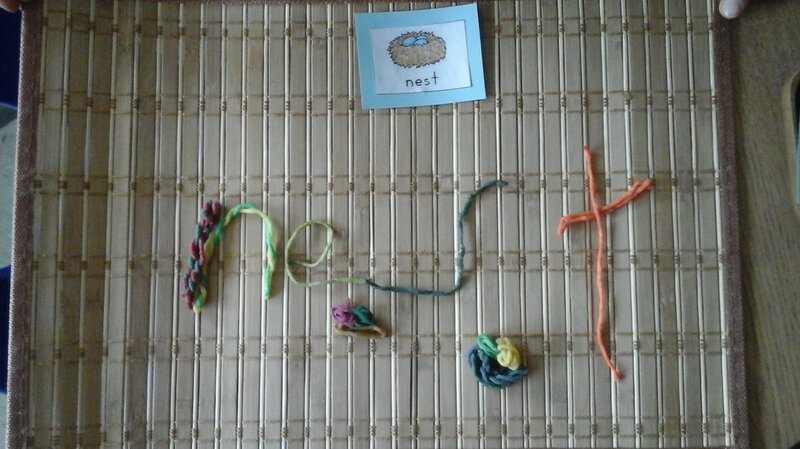 Hopefully when we come back from the Easter weekend we can watch them hatch! 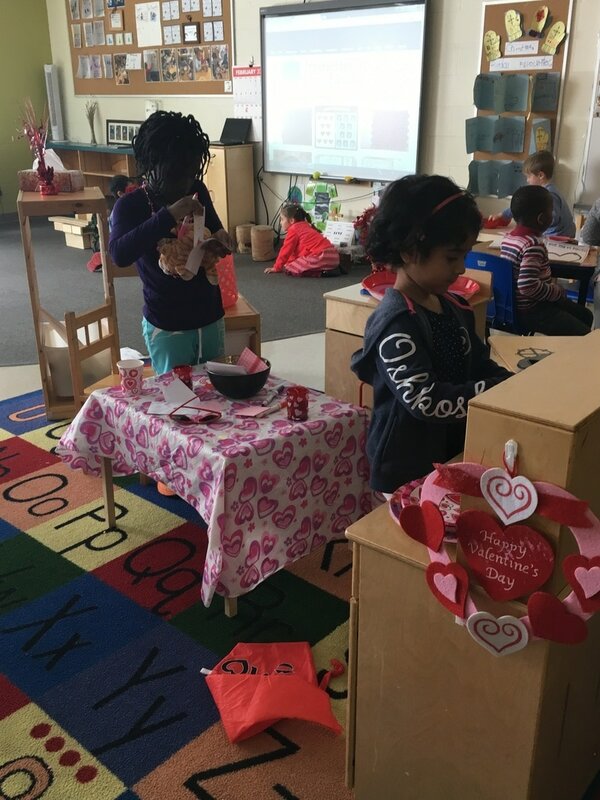 We had a fun filled St. Valentine's Day and week. 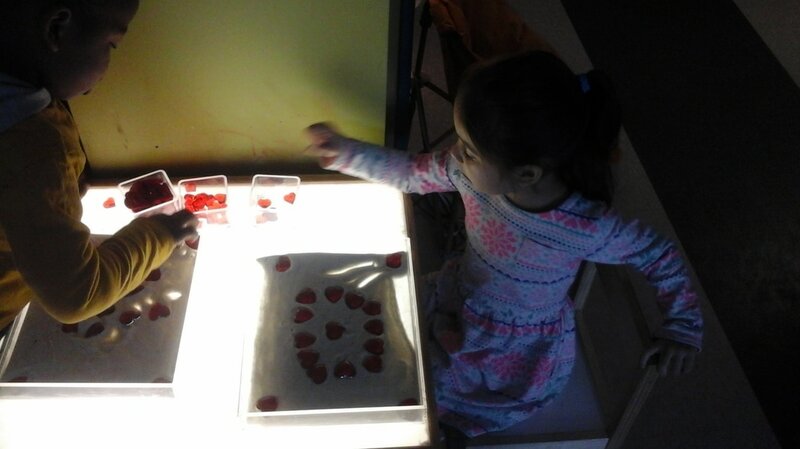 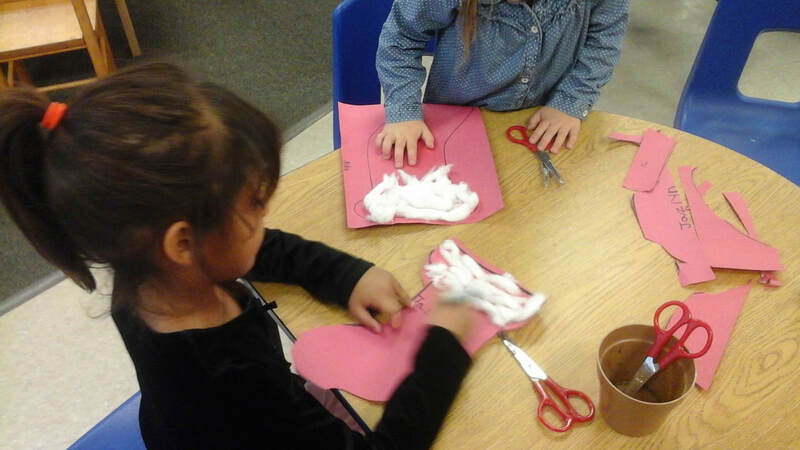 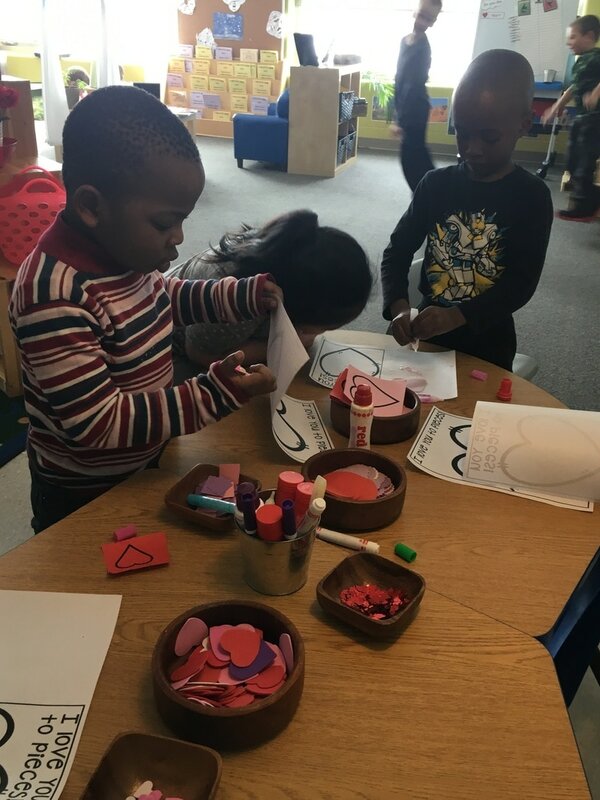 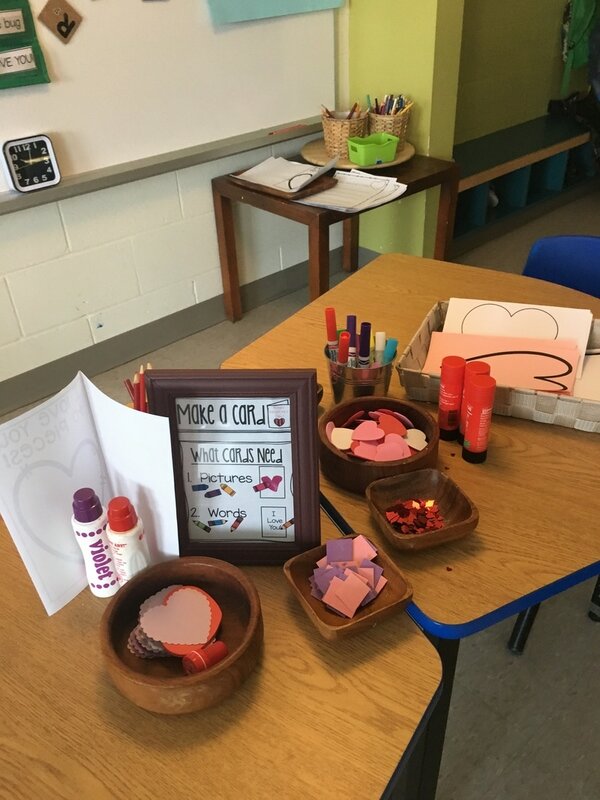 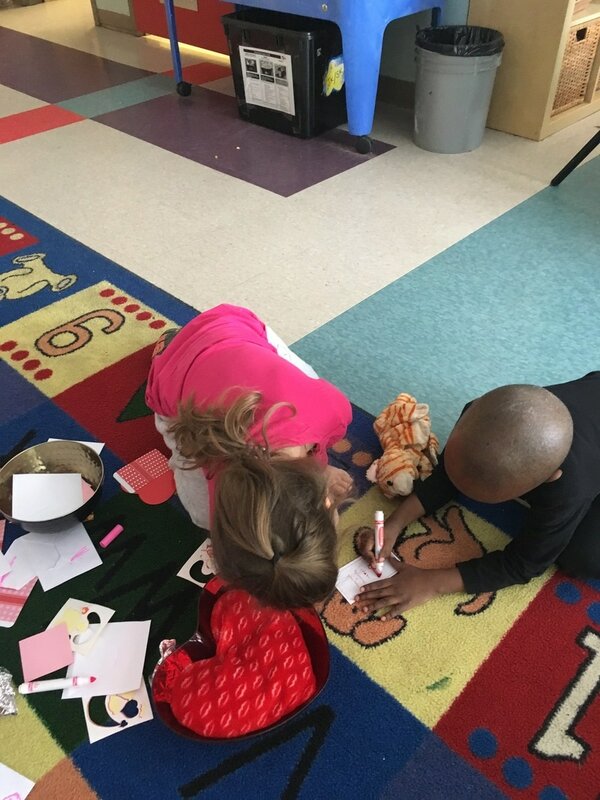 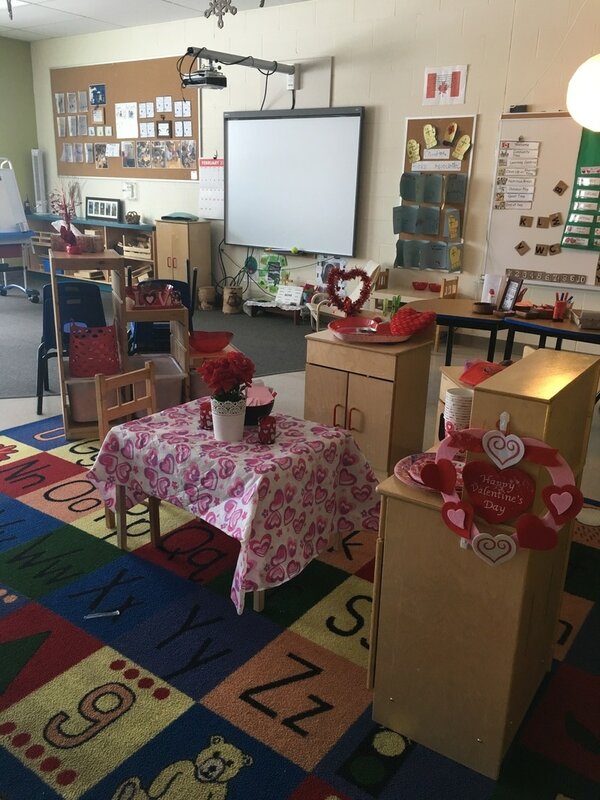 Below are some Valentine Learning Centres the children participated in. 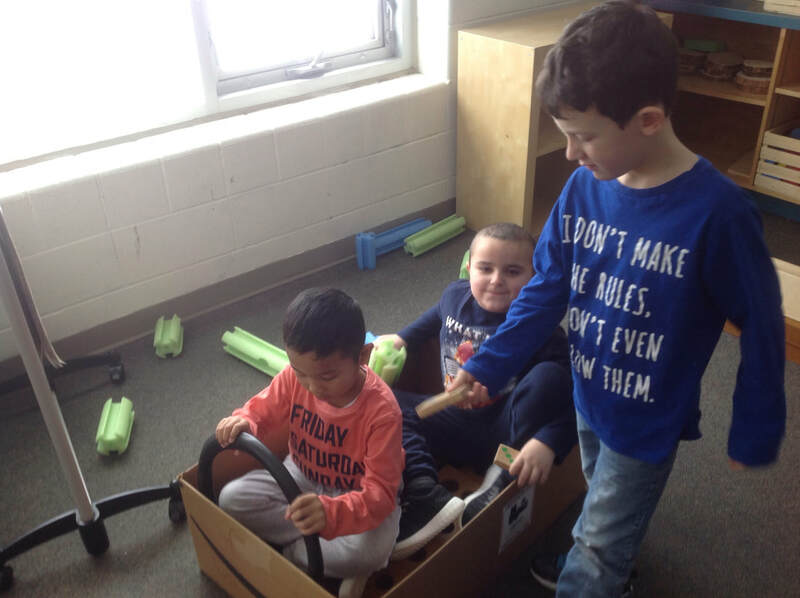 Photos from our Buddy Day on Friday. 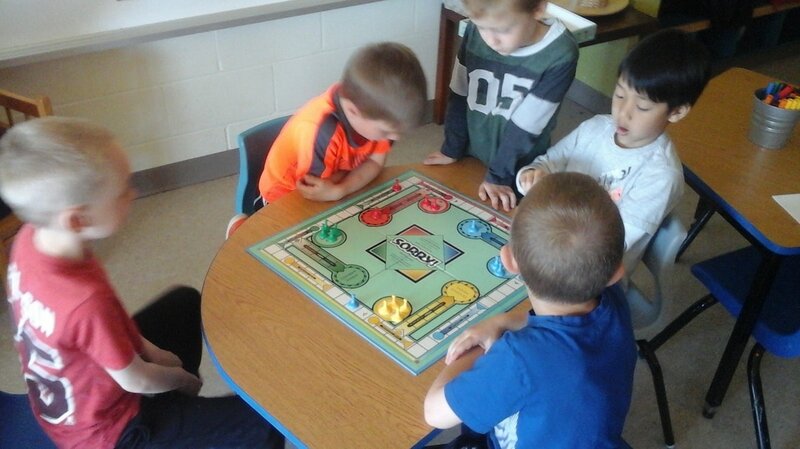 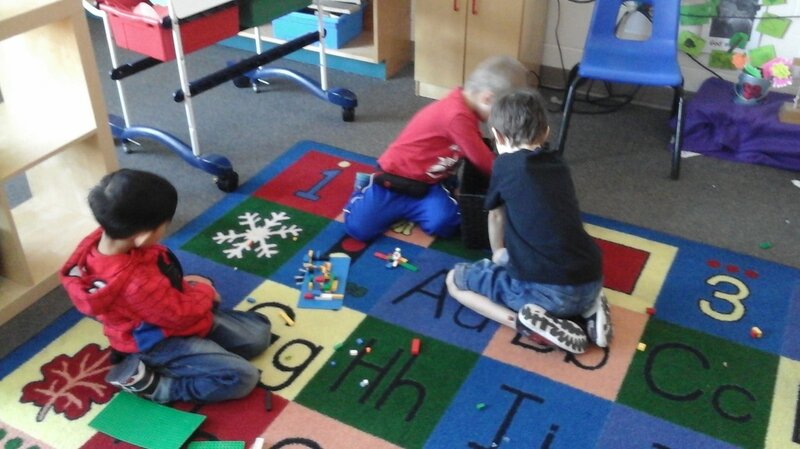 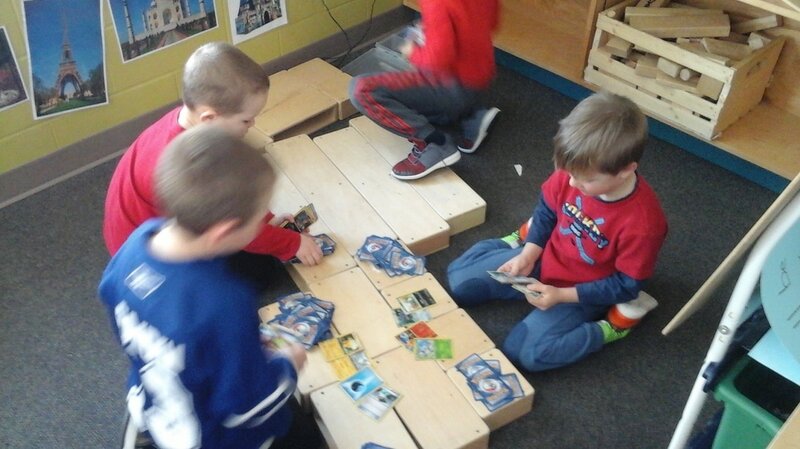 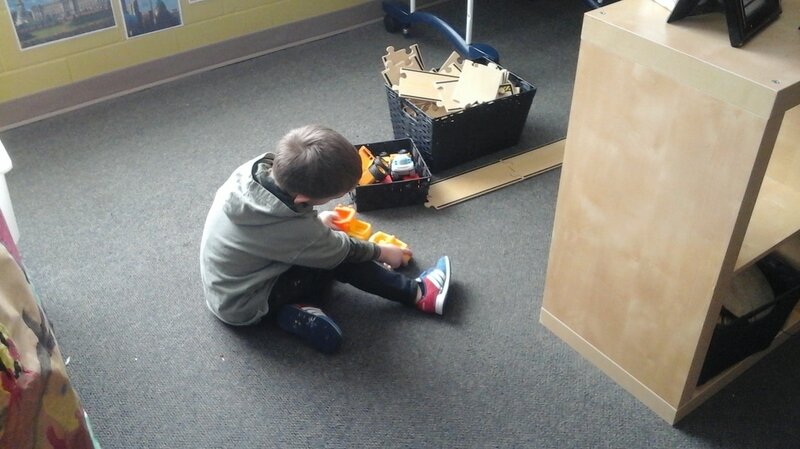 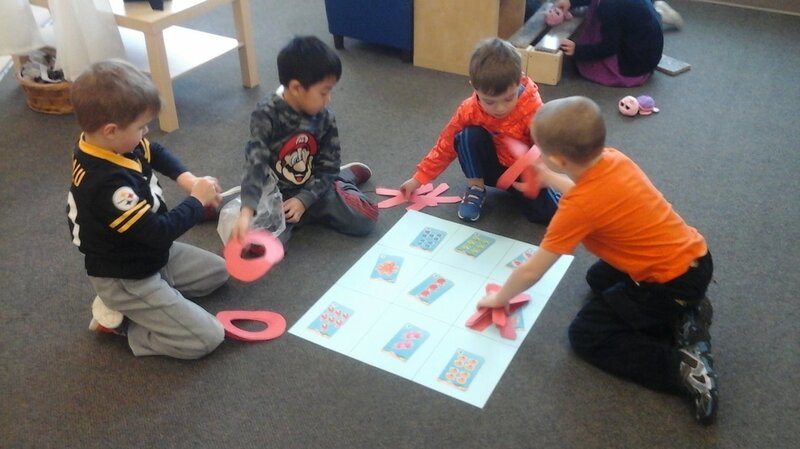 We had a Game Day with the children in our classroom. 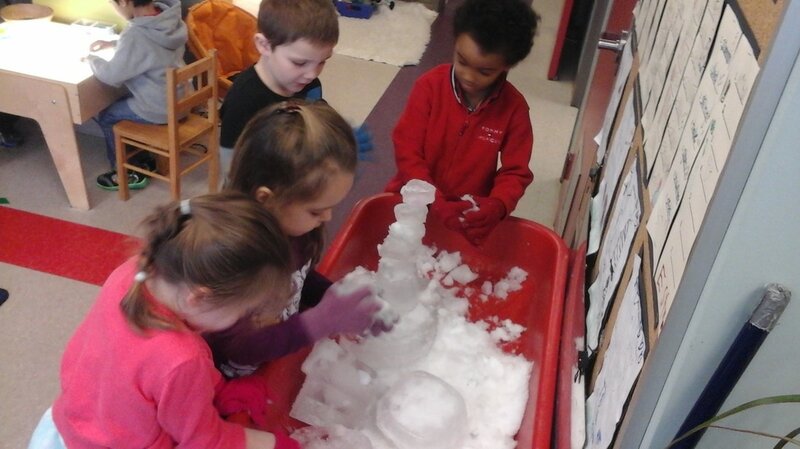 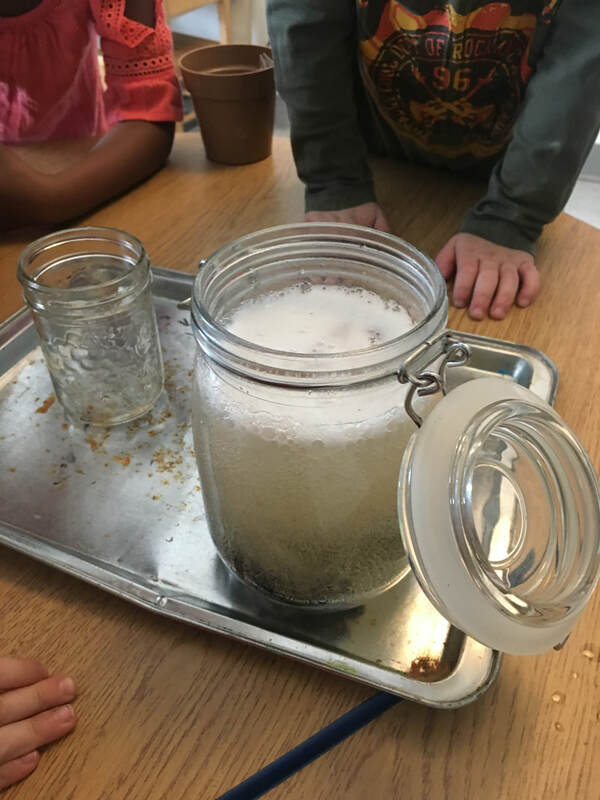 Earlier this month the children participated in an inquiry that involved snow in a mason jar. 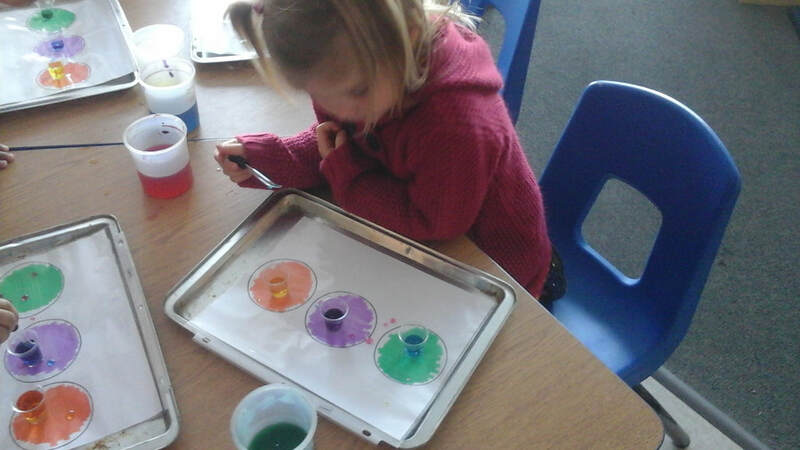 The children were asked to make their predictions and then their discoveries. 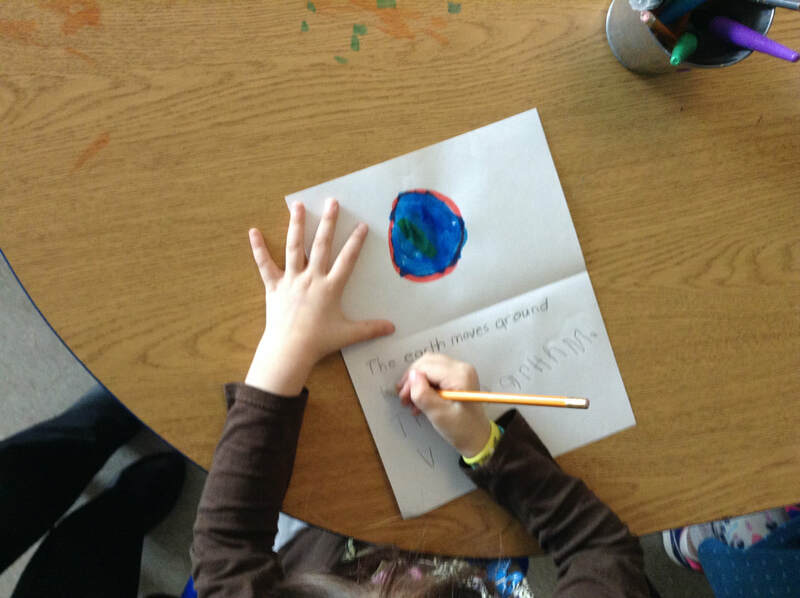 There were three questions posed to the children. 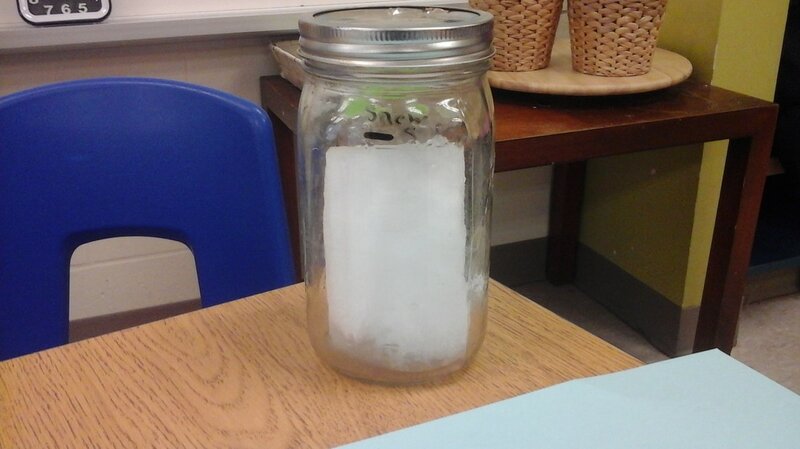 When the snow melts will there be more snow, less snow or the same amount of snow in the jar? 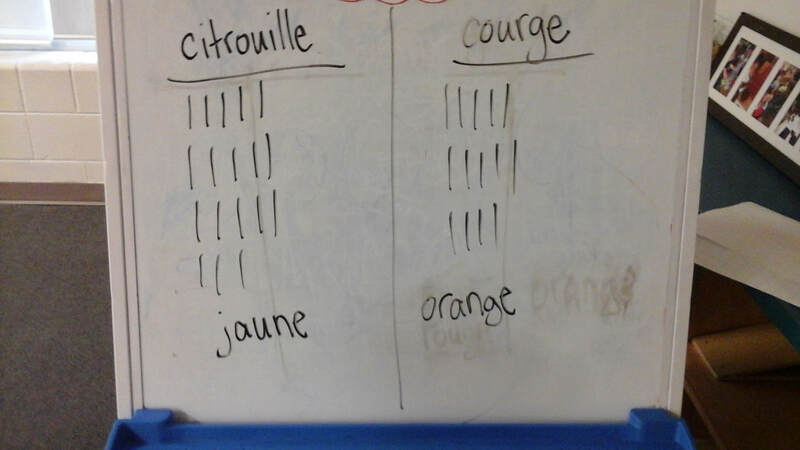 The children also used a tally chart to record their findings.